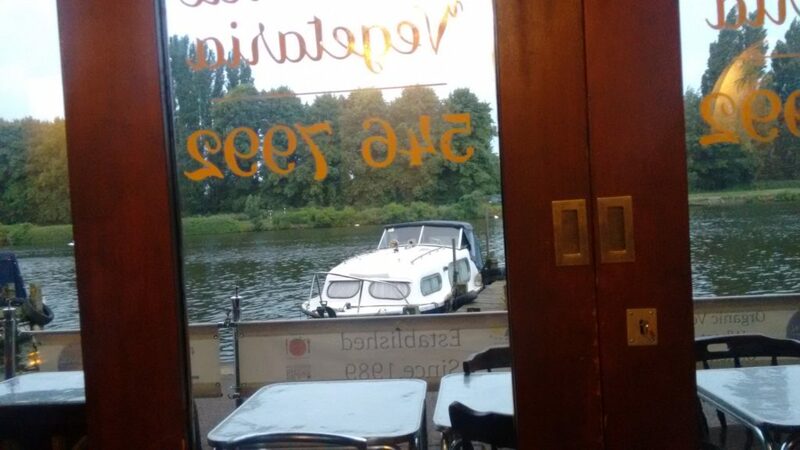 South Londoners and North Surreyites – you need to know about this little gem of a restaurant on the River Thames called Riverside Vegetaria. I paid my second visit there last week, and for the second time had a great evening. It’s in Kingston-Upon-Thames, and a 25 minute drive from my home in South West London. Although I’d say it’s totally worth up to an hour’s travel! 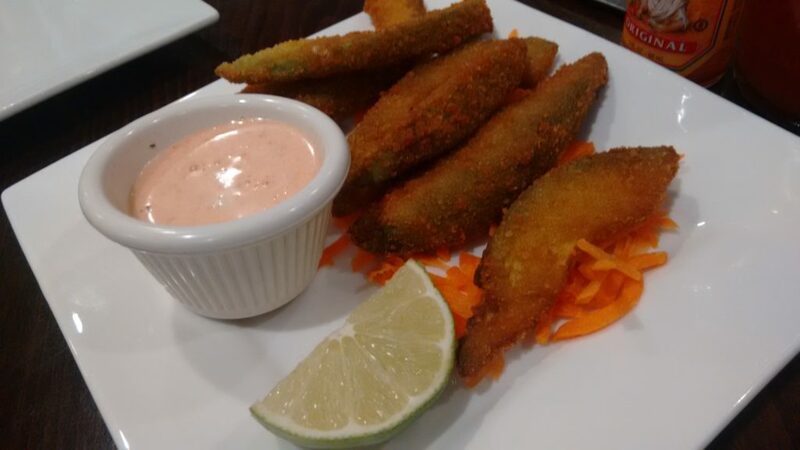 The restaurant has been there for almost 30 years, and has won a ton of awards. The owner has a spiritual philosophy of ‘love all, serve all’ and this definitely shines through in the high quality of the service. Ok, ok, I just wanted to set the scene. 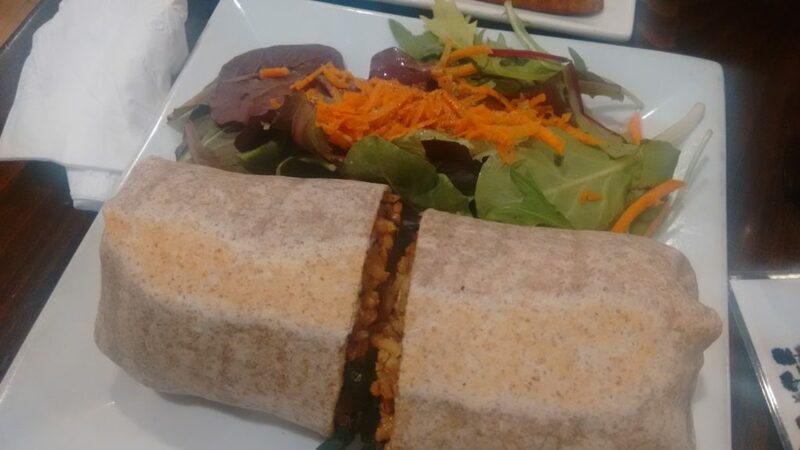 The menu is approximately 80% vegan, and 20% vegetarian, and everything is clearly marked. 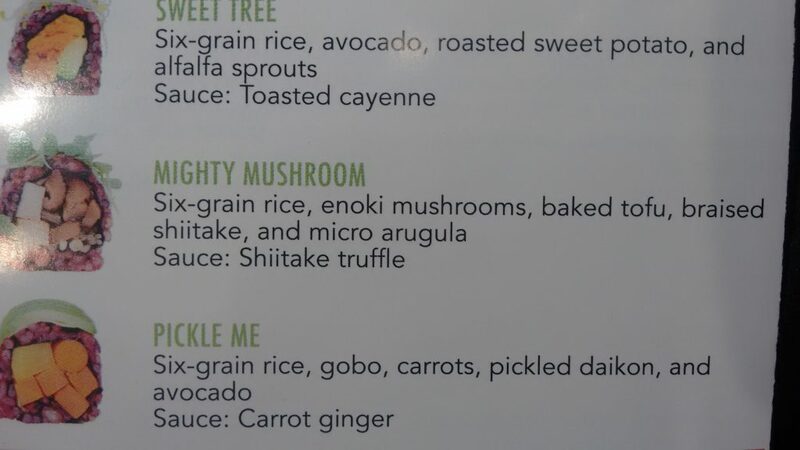 If you are gluten-free there are a large number of items marked ‘wheat-free;’ and if, like me, you are health-conscious, all rice is brown rice, and all grains served are whole grains. Very little oil is used. 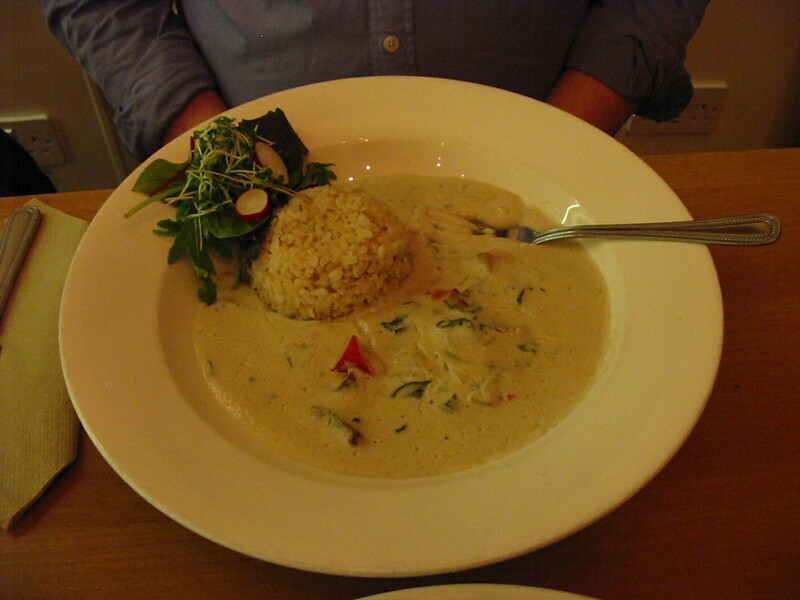 There is a huge variety of dishes available, from Indian dishes, to Mexican, Italian and Jamaican. 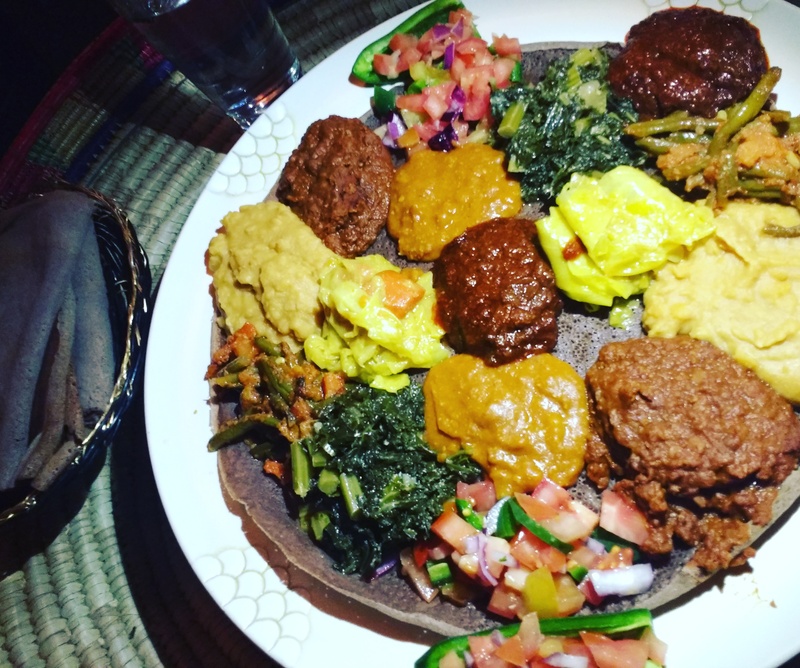 Now when I say that from my experience the food is hit and miss, you need to know that it’s 80% hit, and 20% miss, and even the misses are still good – they’re just not exceptional like the ‘hits’ are. 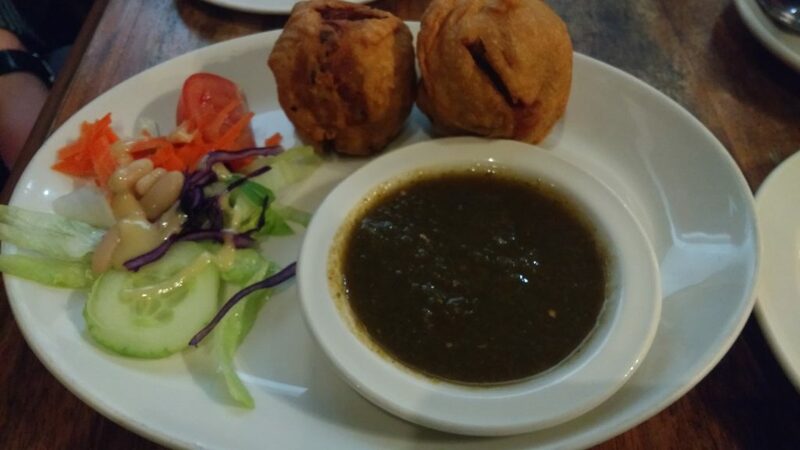 Our stand-out starter is the vegetable balls with coriander sauce. These balls are fried but not at all greasy, and they are brilliantly set off by the intense coriander flavour in the dip. Now as a health freak, I wouldn’t normally entertain the notion of a dosa for a main course. 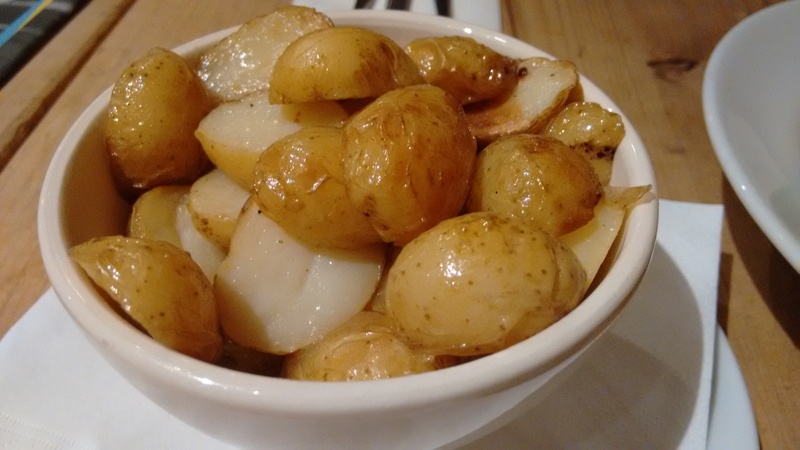 They can be greasy and often contain white wheat flour – which I’m not a fan of. Riverside Vegetaria’s dosa is not only To.Freakin.Die.For taste-wise, but it’s made with lentil flour, is not at all oily, and comes with the most delicious coconut sambal and vegetable sambar for dipping. 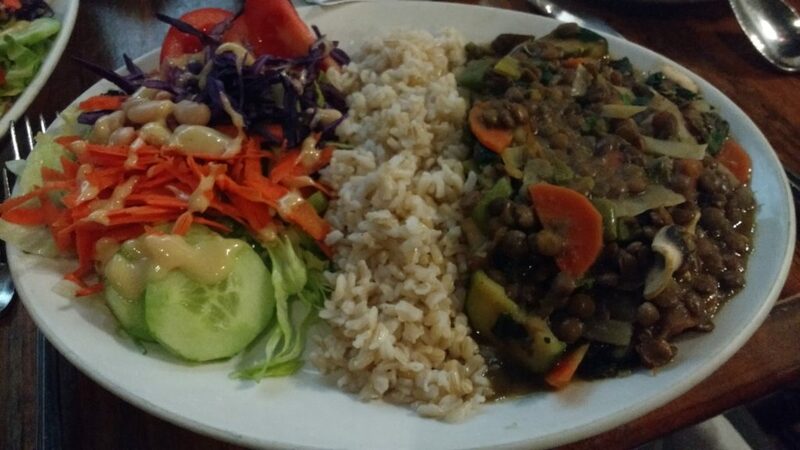 I’ve also tried the Jamaican stew and a special – green lentil curry, which were both excellent. 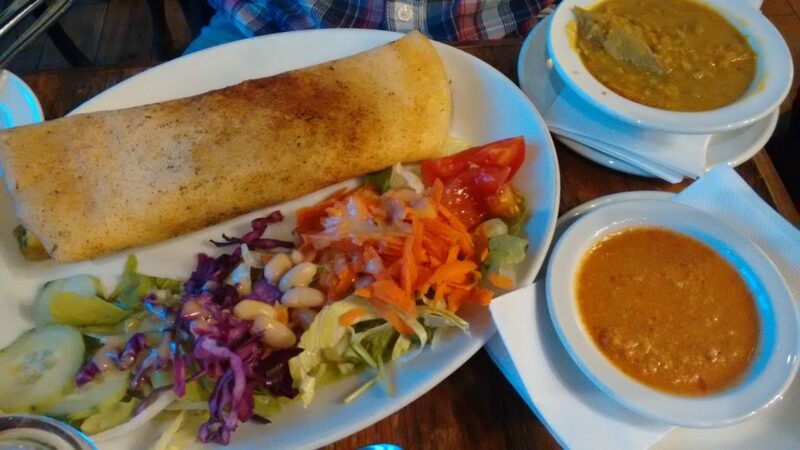 The dosa really is top class though, and my absolute first recommendation. 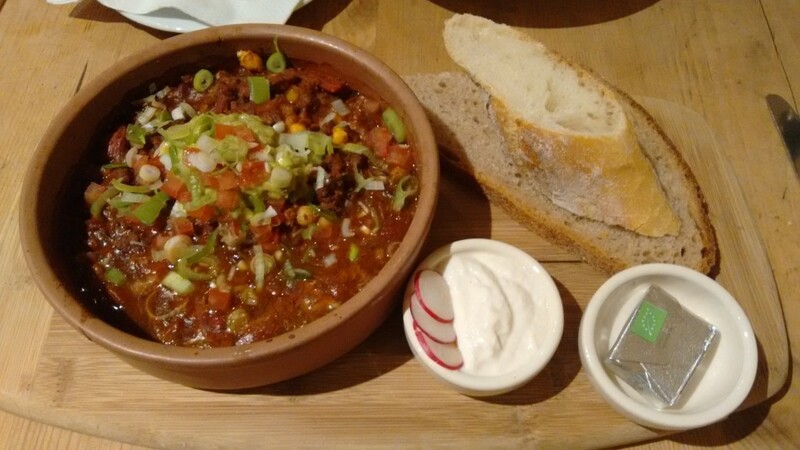 I’ve found that the Italian dishes are not quite as good as the Indian dishes, so my advice would be to stick to spicy Indian, African and Jamaican dishes. 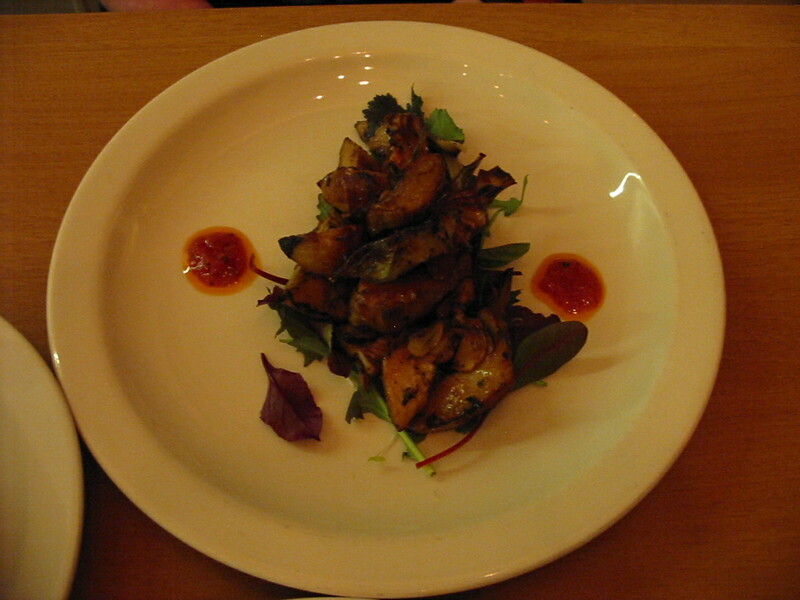 Most dishes come with a colourful salad – not as a sloppy garnish but as a thoughtful, well-presented accompaniment. 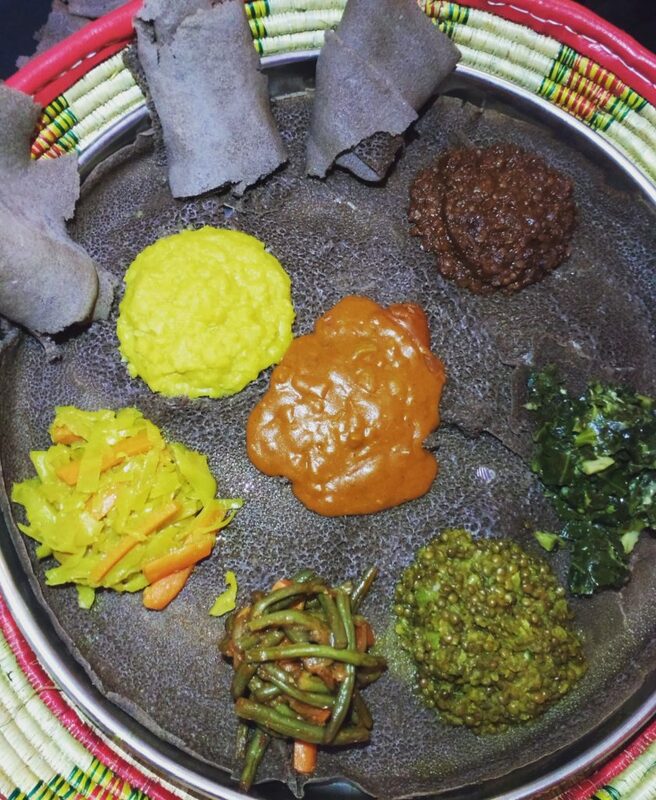 You’ll want to take a pic for Instagram before you tuck in! You must also consult the ‘specials’ board as there seem to be a huge amount every day. 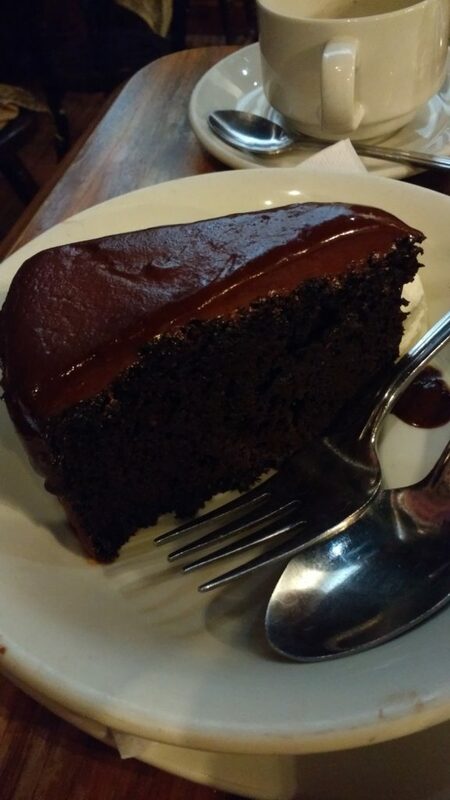 As for dessert, my partner says the chocolate fudge cake was great – moist, rich and as decadent as it should be. I had an orange sorbet which was decent. 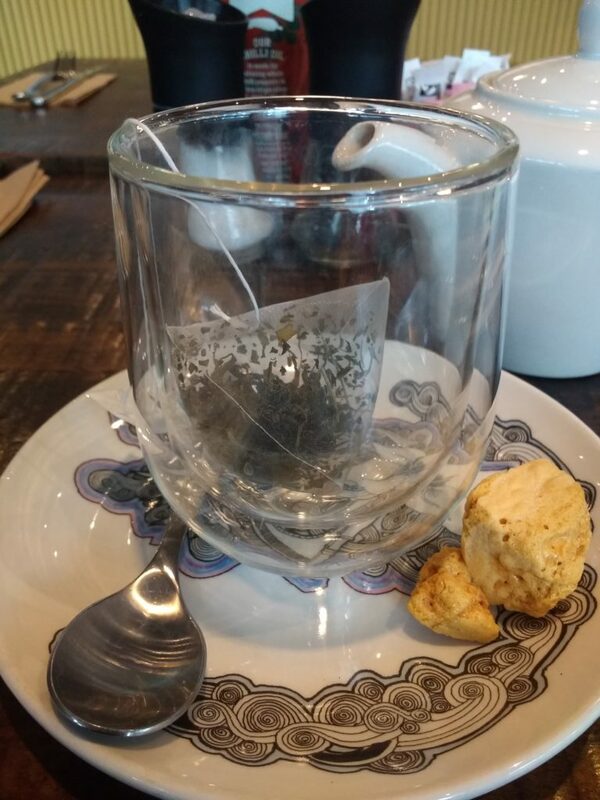 I can’t offer much info about the drinks as I just have tea and my partner has beer. Sorry – we’re just not wine aficionados! Riverside Vegetaria is in a beautiful setting next to the river, with a small outside terrace for spring and summer dining. 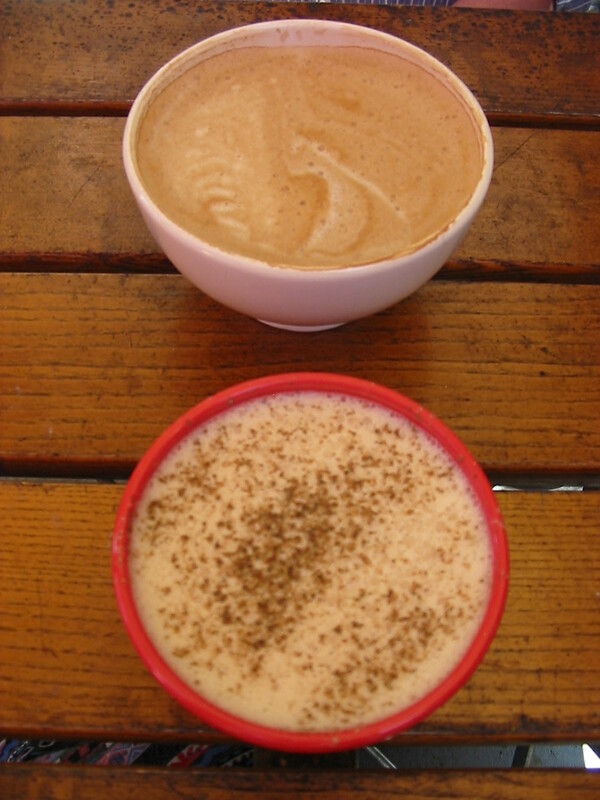 The decor is cozy and cute; prices are absolutely fair; and the vibe is friendly, casual, local and inviting. 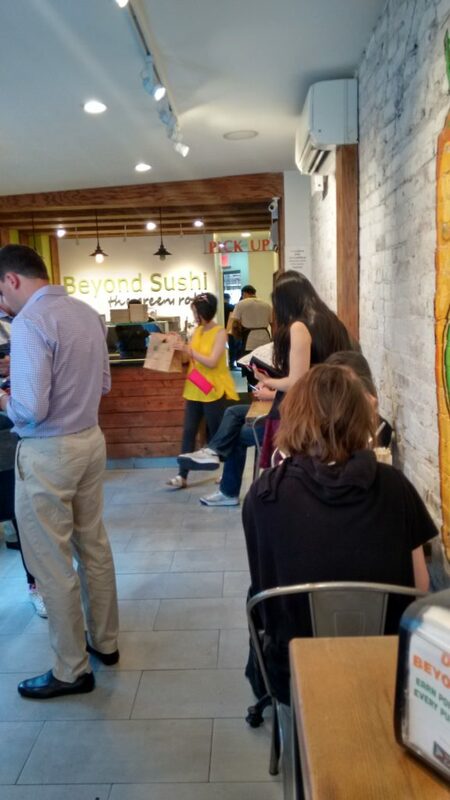 The only downsides are that the space is very small, and fills up quickly as the restaurant is so popular. You can find yourself squeezed in tight with the neighbouring table practically joining yours. Not too cool if you wanted a more intimate meal with a friend/partner. I guess this is worse in winter because the outside space is closed, so they have to maximise covers inside. 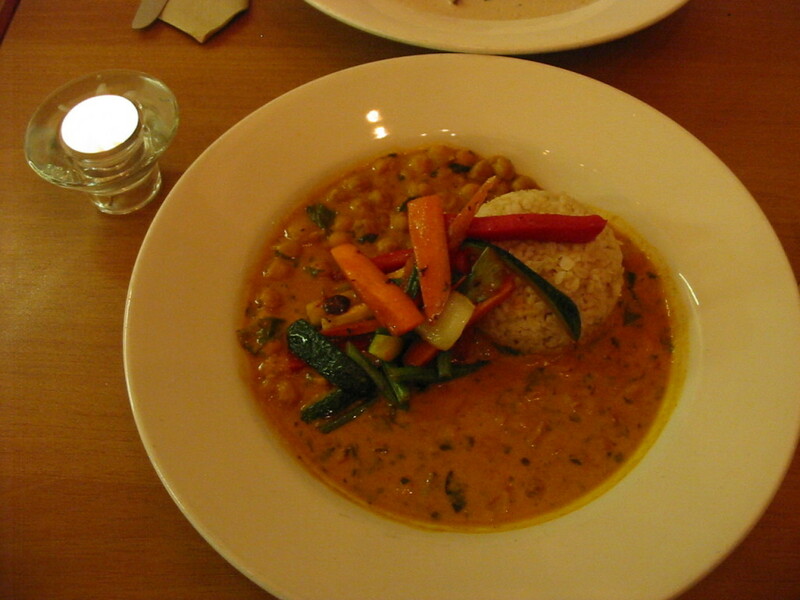 My advice is to visit on a Monday or close to the beginning of the week, or wait until later in the evening when the restaurant has emptied out a bit, to have your meal. Yorica Ice Cream London: A Review. 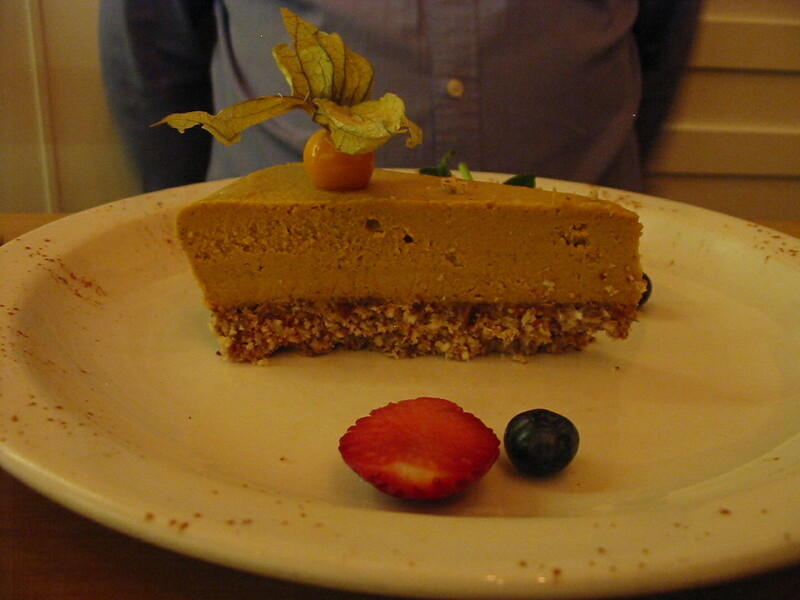 It’s way past the time that I should have written my review of Yorica, London’s only fully vegan ice-cream parlour. It’s been about three months since I visited the first time, and about six weeks since I went the second time. I put off writing this because, well, you’ll see. 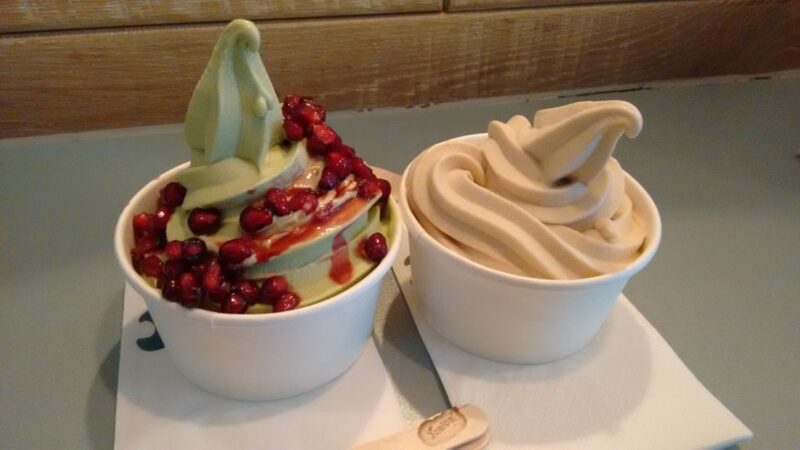 I remember being soooo excited to hear there was an ALL.VEGAN.ICE.CREAM place in London. This stuff normally happens in New York or Austin – not London! And it’s on Wardour St, one of my favourite streets ever!! It opened in March, but I didn’t have occasion to visit until July of this year. 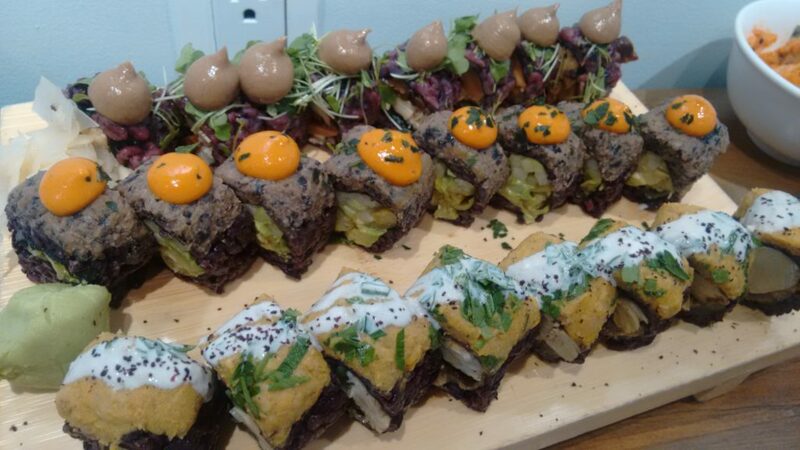 I was with my (non-vegan) mum. The idea was we’d have a mini ice-cream crawl. 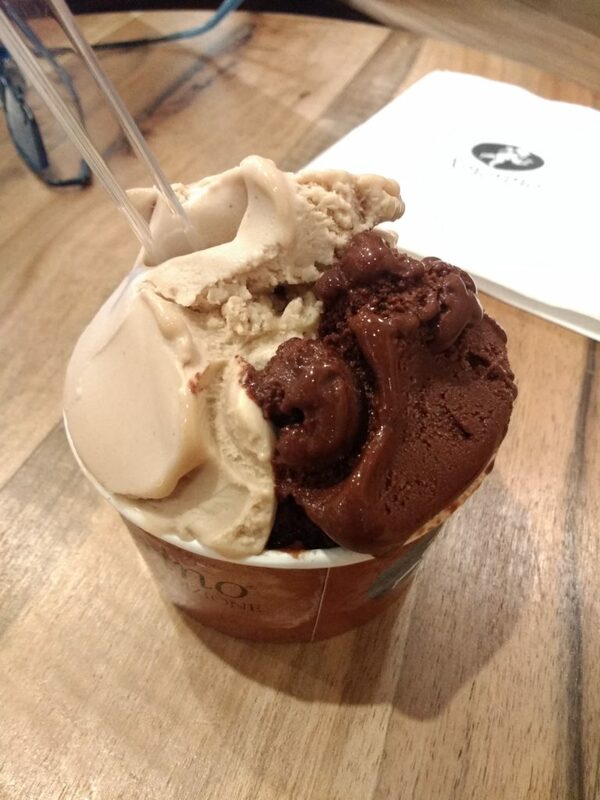 First, a gelateria in Covent Garden, which has several vegan options, then on to Yorica. Yorica actually offer froyo as well as ice-cream, so if you want a lighter dessert, you’re covered! There’s a decent selection of toppings at the counter; healthy ones – blueberries, pomegranate seeds etc, along with the old fun favourites – sprinkles, candy, marshmallows, gummy bears, oreos etc. There are also sprinkle machines in the main space, so you can cover your ice cream in however much crap you want! I try and limit sugar now for health reasons, but I know that if I’d visited as a kid, I’d have thought this place was heaven on earth. This visit, I opted for the matcha froyo. Partly because it’s one of my favourite flavours, but partly because I wanted it ‘soft serve’ (‘Mr Whippy style’ to us Brits!) Only the froyo is soft serve, the ice-cream is scooped. Look. I can only be honest. Much as I hate to say anything less than congenial about the first vegan ice-cream joint in London; I ain’t gonna lie either. 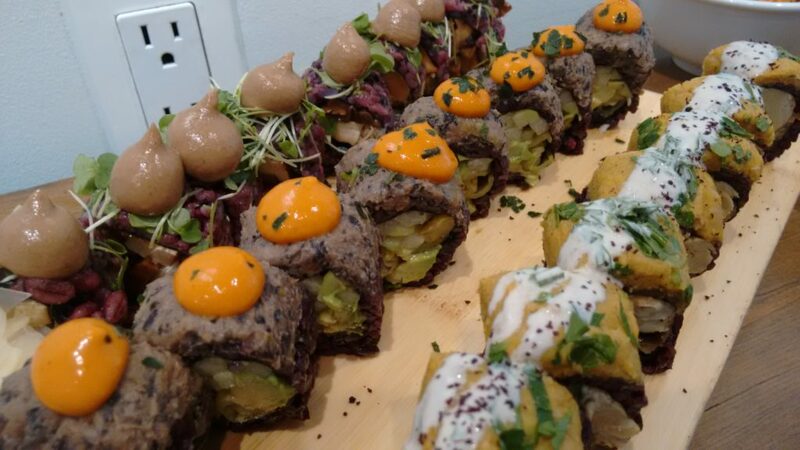 There’s no reason why we should hold a vegan place to a lower standard than a non-vegan place. That wouldn’t make sense. And perhaps you’ll have a different experience to me in any case. Firstly, the pomegranate seeds were not fresh; they were pretty dry and hard. I was worried I’d lose a filling so I spat them into a tissue. This alone was not a problem to me. So it was a bad day for the pomegranate seeds, so what? I still had all that luscious froyo right? You know, the matcha froyo didn’t taste bad; it just wasn’t great, and didn’t particularly taste like matcha. It was pleasant enough for a few mouthfuls. Then, something happened which just does.not.happen.to.me.ever. I found I was having trouble finishing it up!!!! It was just a medium pot; not super big, and bear in mind I can eat a whole pint of Luna & Larry’s Coconut Bliss, no problem! I really wasn’t enjoying it as much as I’d hoped to. The caramel froyo my mum had was a little bit better, but not much. I think part of the problem was the lack of creaminess, and I figured that froyo wouldn’t be as creamy as ice-cream, what with it not being, um, cream, right? So I thought it was only fair to give Yorica another try before I wrote a review, and I’d be sure to get some actual ice-cream next time. SO, a month or so later, the next time occurred, and I found myself at Yorica again, on this occasion with a friend. This time I wanted strawberry ice-cream. 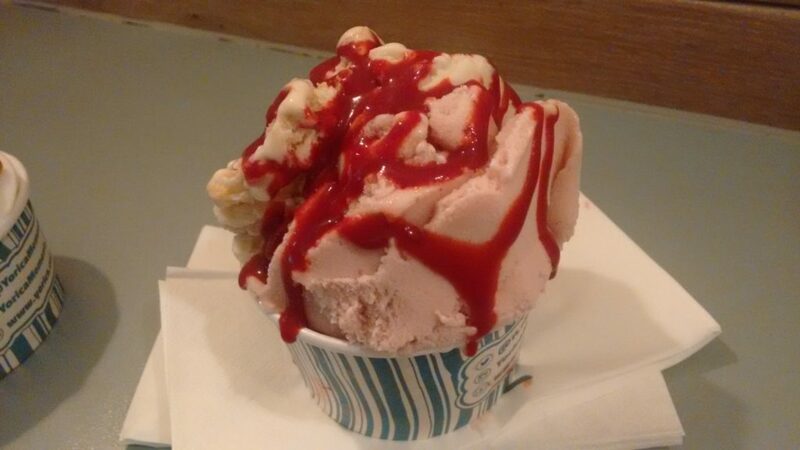 When strawberry ice-cream is done well, then it’s glorious. No need for bells and whistles. 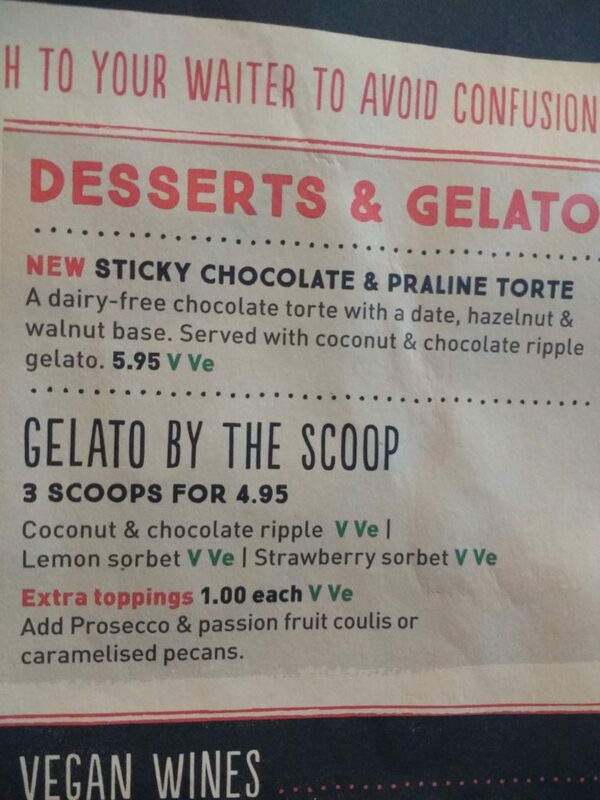 I had a big scoop of strawberry ice-cream, then inquired about a flavour that I wasn’t sure about. I was told it was called ‘wowbutter’ which is like peanut butter, but not peanut butter. 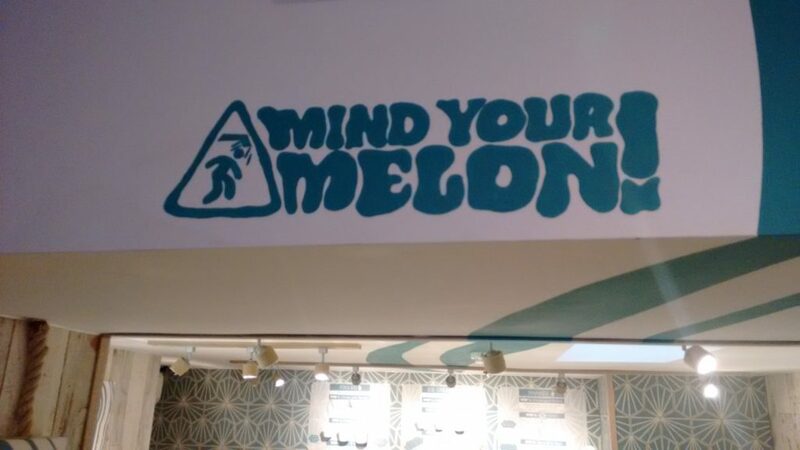 Uh, ok! Nothing else was really tempting me so I got a big ol’ scoop of that too. A drizzle of strawberry syrup to top it off, and then I couldn’t wait to get stuck in! I really wanted it to be great, but….it just wasn’t. I had trouble finishing this too. 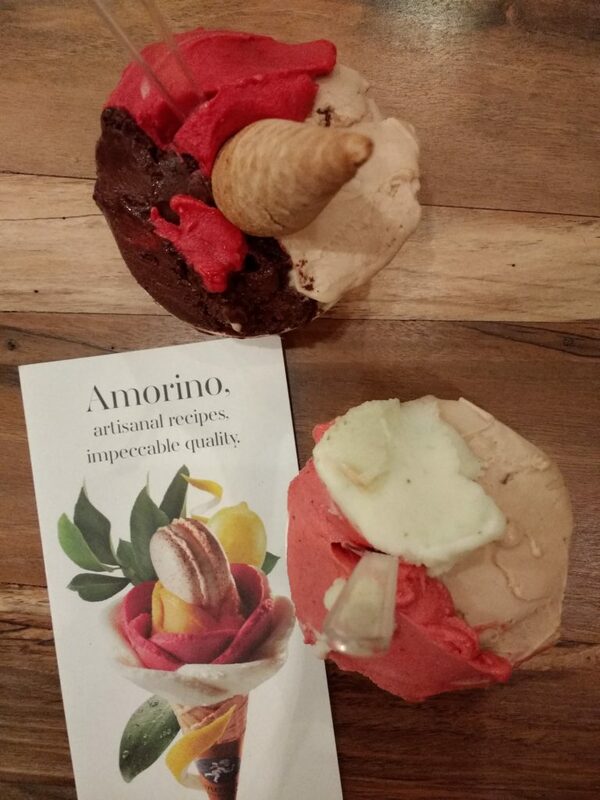 Both flavours just tasted like….cheap ice-cream. 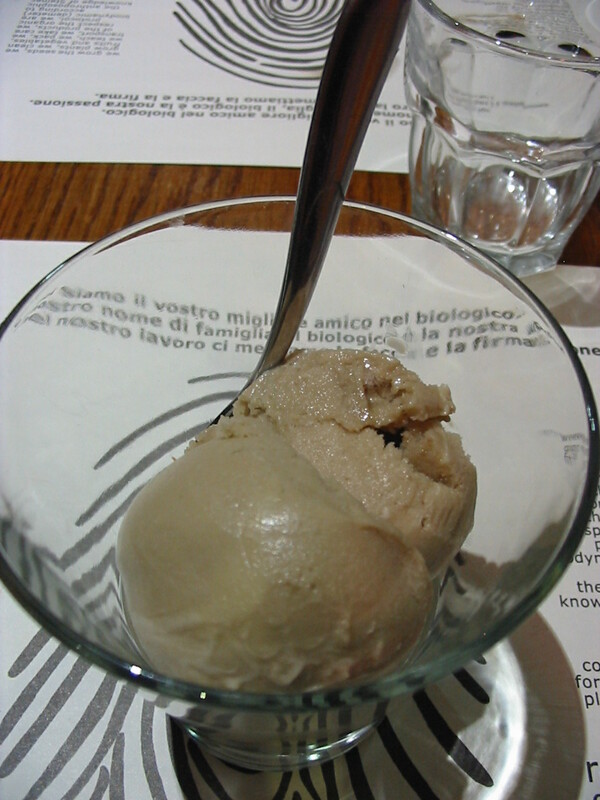 I KNOW how great vegan ice-cream can be. 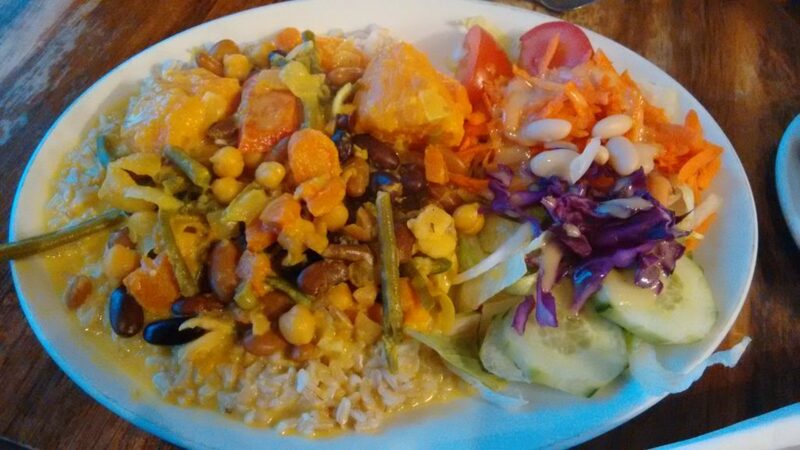 There’s an all-vegan place in Austin, Texas which had me going back for 3 more helpings. And I already mentioned how much Luna & Larry’s coconut Bliss I can devour. 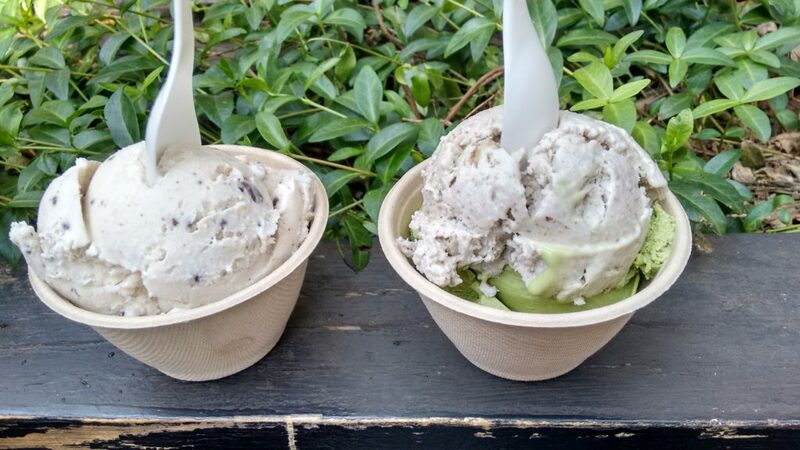 So Delicious, too, are champs at plant-based ice-cream. I can’t work it out exactly. I asked what the ice-cream was made with, and was told rice milk. I feel rice milk may be too thin to make a decent ice-cream, perhaps this is the problem? 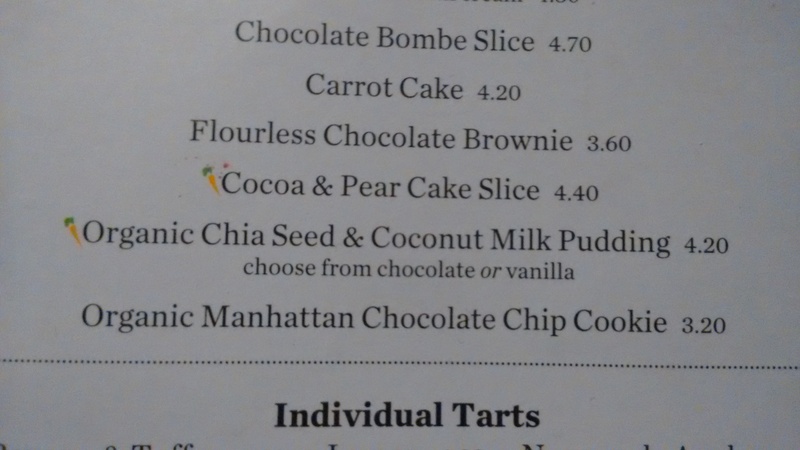 I’m not sure though as it was also a taste problem, not just texture. The place is pretty; the service is friendly; and it’s fun looking at all the things you can top your dessert with. I may come back with my friends’ kids – I know they’d adore topping their ice-cream with ten tons of candy! And if I was out with several friends just looking for something fun and light to do, I may bring them here. BUT…if I’m out on the town looking for a truly yummy iced dessert with my partner or a friend, I’ll probably go to one of the gelaterias that have vegan options. 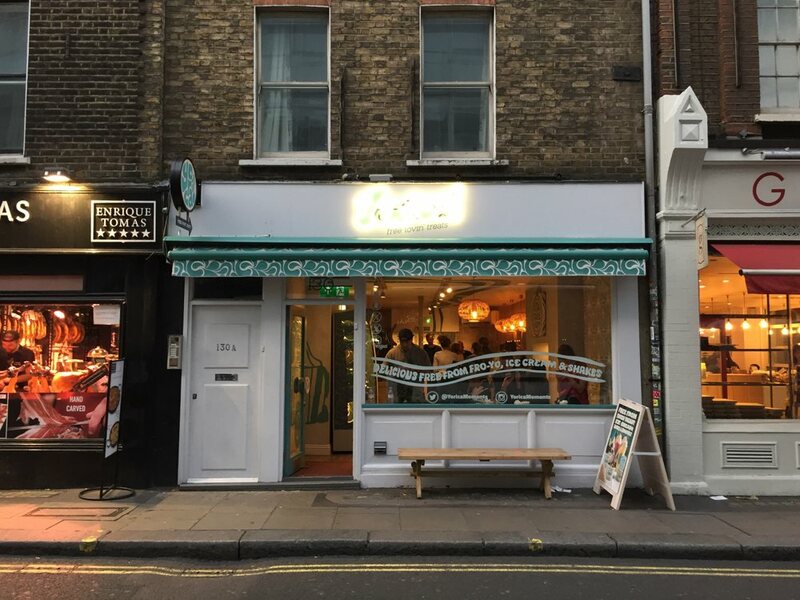 La Gelatiera on New Row for example (which has a good number of options), or Snowflake, a few doors down from Yorica on Wardour St that has one or two vegan options. 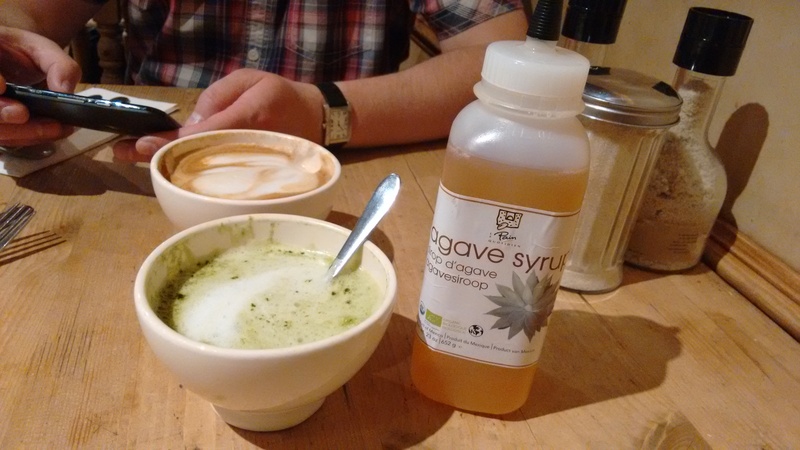 Author Karen (Vegan Coach)Posted on October 17, 2016 October 17, 2016 Categories Plant-Based Product Reviews, Restaurant/cafe reviews, UncategorizedTags ice-cream, plant-based, restaurants, review, vegan2 Comments on Yorica Ice Cream London: A Review. So what do you do for the twenty-first anniversary of the day you and your partner got together? 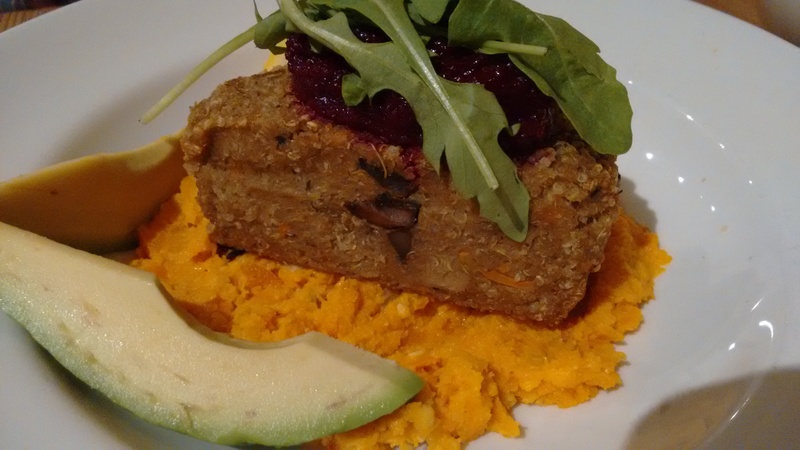 Go for a hearty plant-based meal, that’s what. Er… WITH your partner, in case that wasn’t clear! 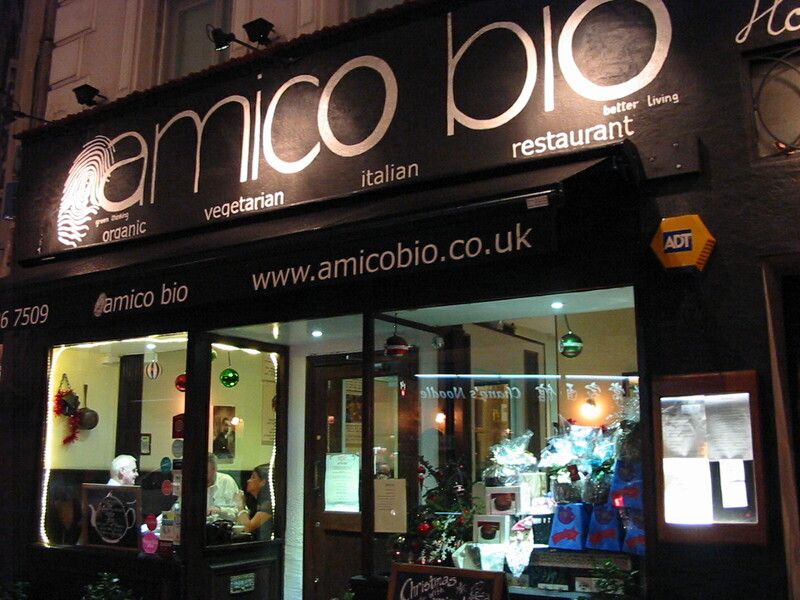 We nearly didn’t go anywhere, what with it being a miserable, drizzly and cold London night, but the promise of good food (as always) motivated us to shake a leg, so off we went to try Amico Bio, a family-owned Italian vegetarian/vegan restaurant in London. 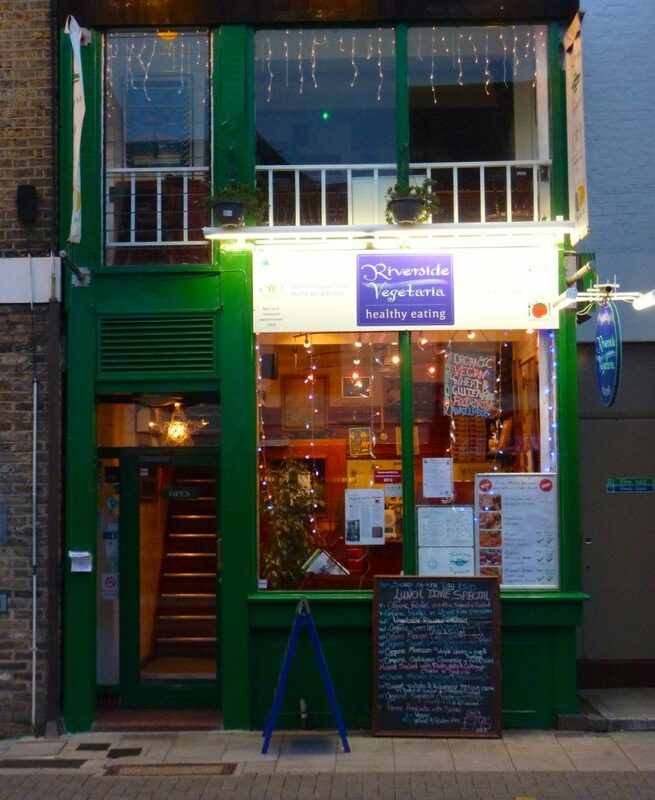 A veggie Italian restaurant is a very rare thing. In fact I don’t know any other. 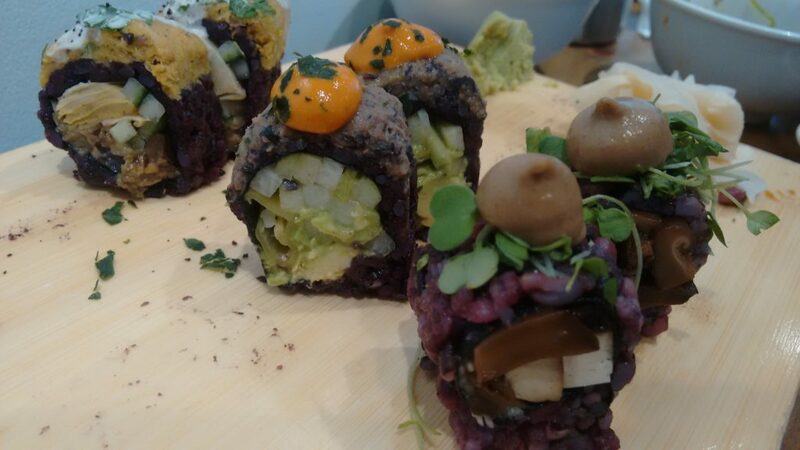 Italian food, like French, often includes meat, cheese and cream, so is harder than other world cuisines to replicate in a veggie version – so we were really curious to see what it’d be like. There are two branches of Amico Bio. 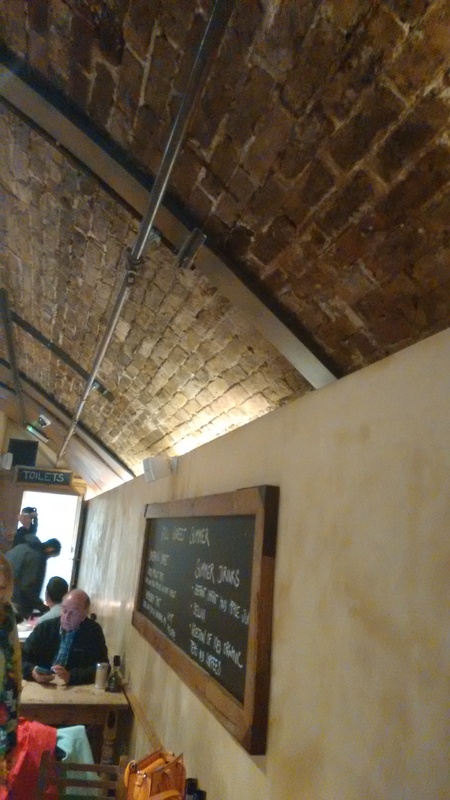 I believe the ‘original’ is in Smithfields, and the ‘spinoff’ is the Bloomsbury side of Holborn. 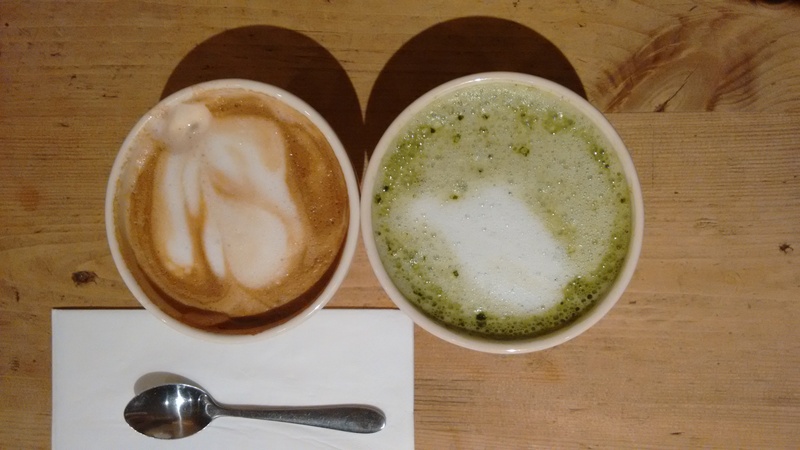 We went to the Holborn branch – just because it was closer. I’m not a huge fan of Italian food. 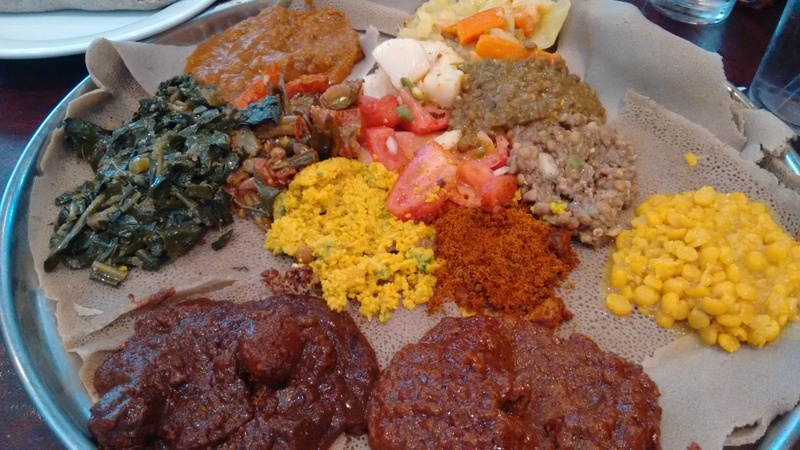 My favourite foods tend to come from Africa, Asia, the Middle East and South America and contain a multitude of spices, so Italian food to me by contrast is a little, well, dull. 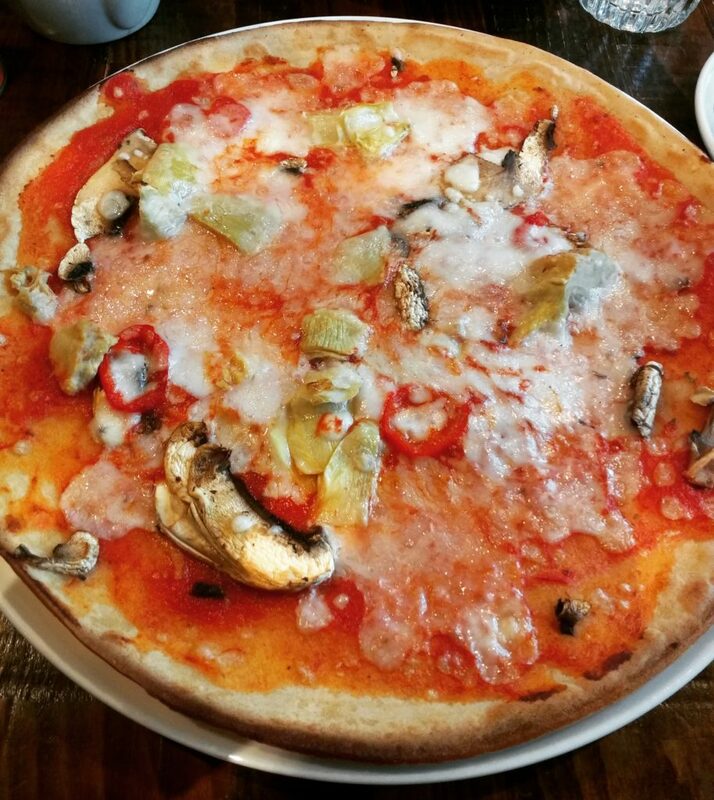 I KNOW, I KNOW, Italian food can be incredible, and I particularly like the emphasis on fresh, luscious veg and fruit that you find in Mediterranean cuisine, it just wouldn’t be my first choice, is all. I think also, the prevalence of white wheat pasta and white bread puts me off a little. My partner loves Italian food, but hasn’t had much of it of late (or since I encouraged him to try food from a little further afield! ), so it was nice for him to be reacquainted with it. 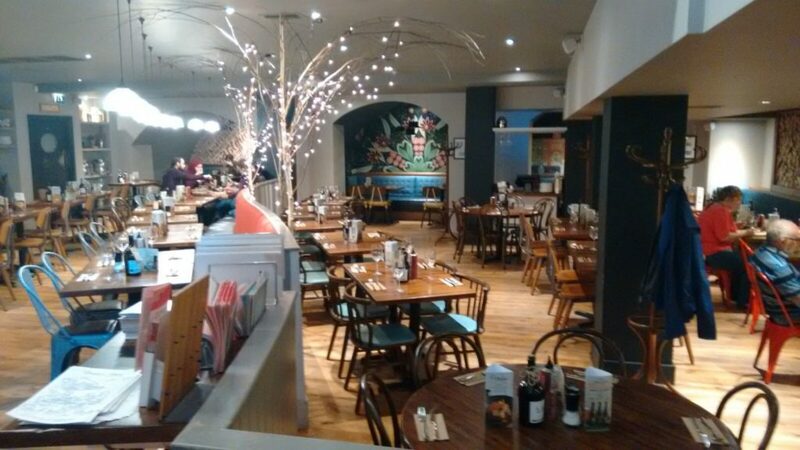 Sorry for the crappy interior photo – you really need to see the back of the restaurant to get the whole effect, but I was worried I was starting to look weird to the other diners. 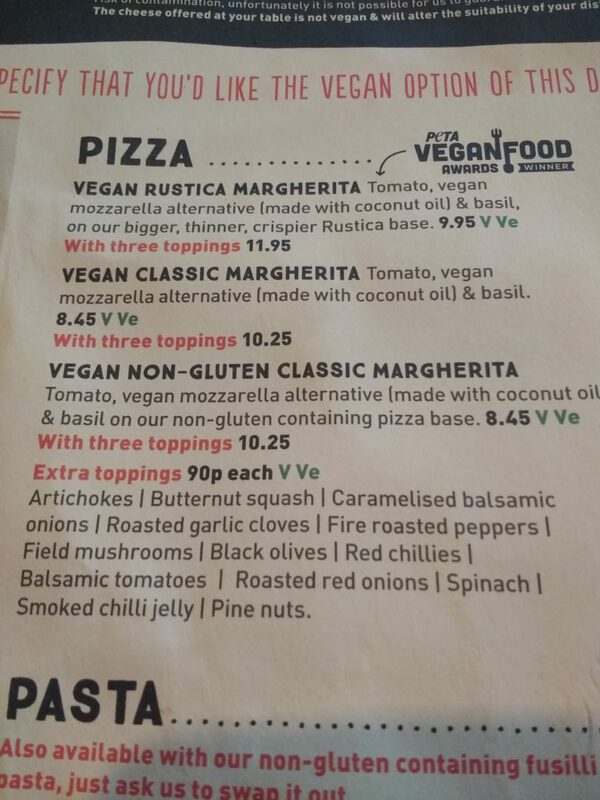 Apparently all the veg for the restaurant is grown on the family farm in Italy, so it promised to be full-flavoured and divine. 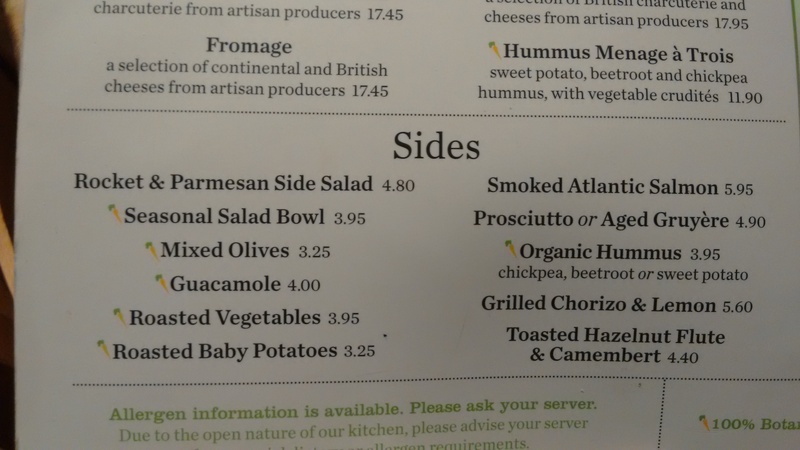 The online menu of Amico Bio offered a whole grain option – a risotto made with brown rice, and I was disappointed it wasn’t on the menu the night we went. 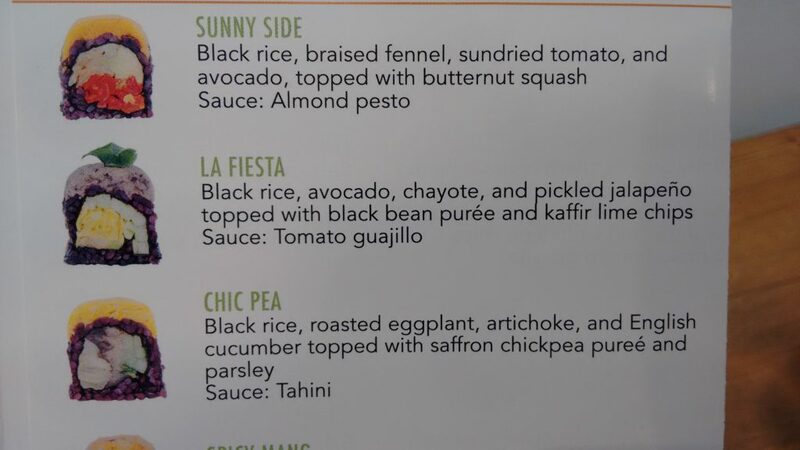 It DOES say online that menus change according to the produce available, but you’d think brown rice would be available all year? 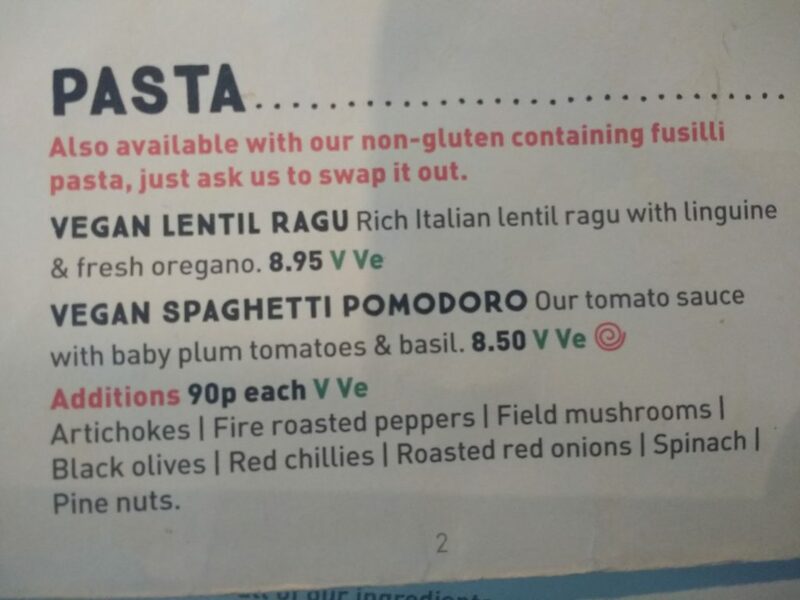 They also have a store in the restaurant that sells wholemeal spelt, and buckwheat flour, so you’d think they’d want to have some whole grain pastas available on the menu, but it doesn’t seem to have been considered. I don’t get this. 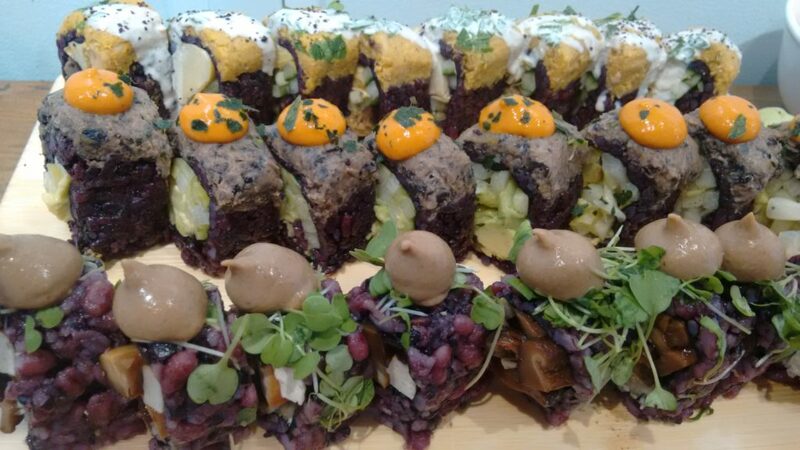 If you’re open-minded enough to drop the meat from your traditional cuisine, and you tout the health benefits of your food, why not also make dishes with whole grains, to really optimise the health and wellness benefits? 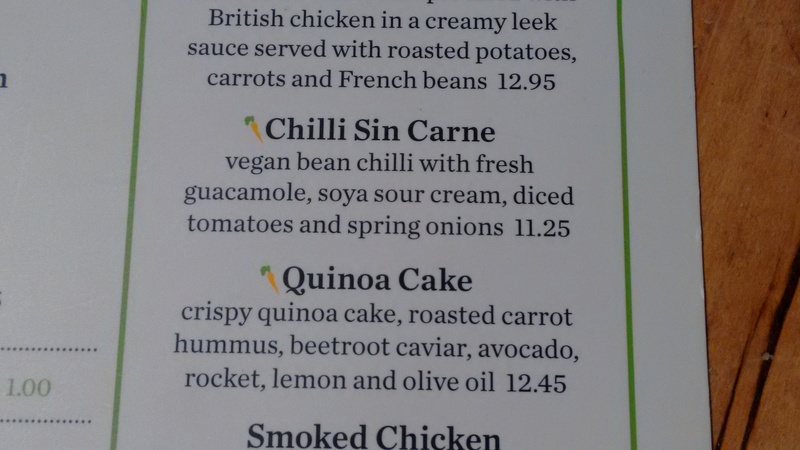 There seemed to be more dishes containing dairy cheese than I remembered from online too, but there were lots of vegan or ‘can be made vegan’ options. 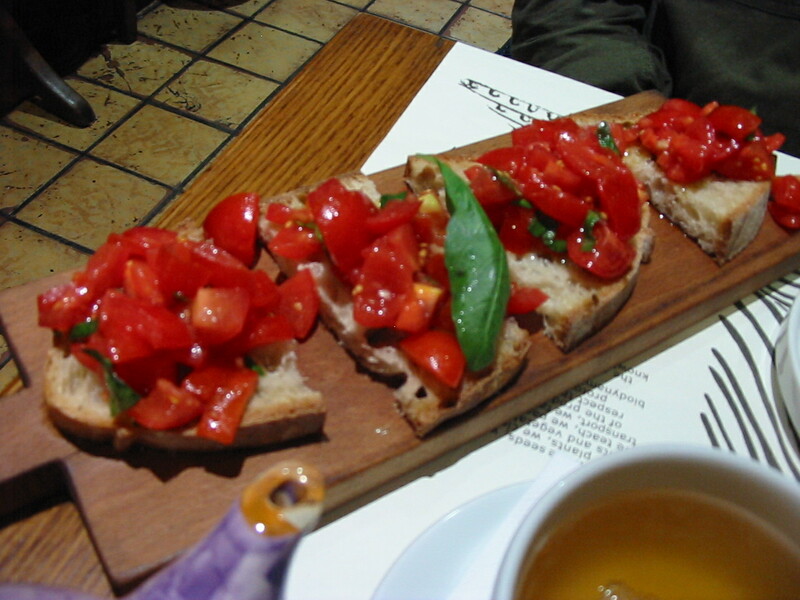 We shared a bruschetta starter which was the most incredible tasting olive oil drizzled over fresh cherry tomatoes and basil. 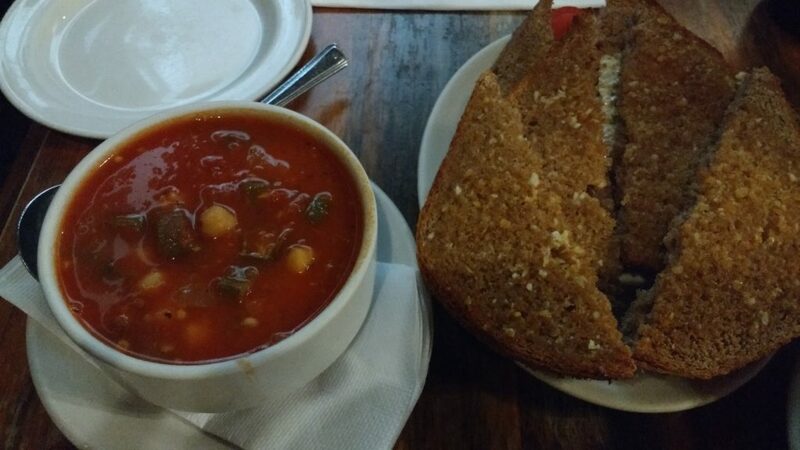 I’ve never had bruschetta before so I have nothing to compare it to – and it’s a shame the bread was white (why use heavily processed wheat in your bread when the emphasis is on whole, fresh foods??) but the tomato, oil and basil mix was gorgeous – to the point of me craving it again today. UK supermarket tomatoes just don’t compare to Italian tomatoes grown on a farm. 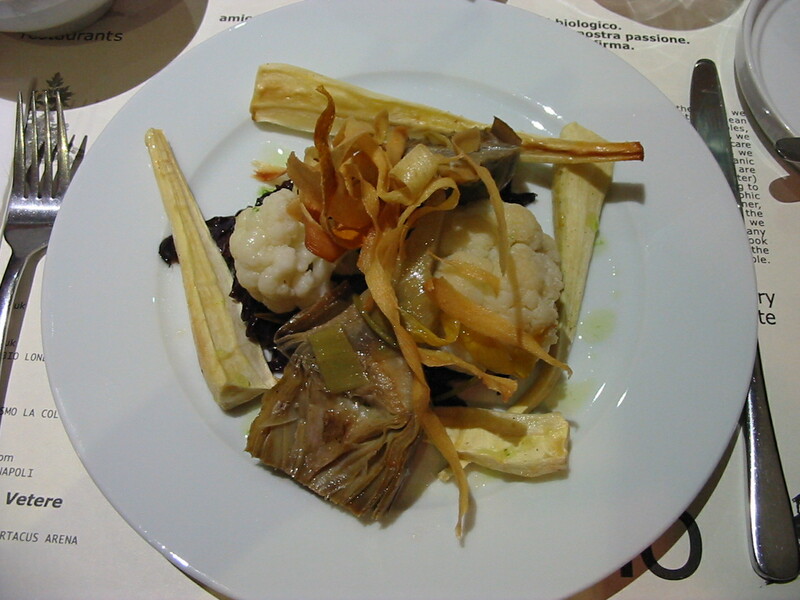 For a main course I chose ‘Carciofi e culvofiori brasati con parsinache arrosto e cavolo rosso‘ – braised cauliflower and artichokes, roasted parsnips and braised red cabbage. 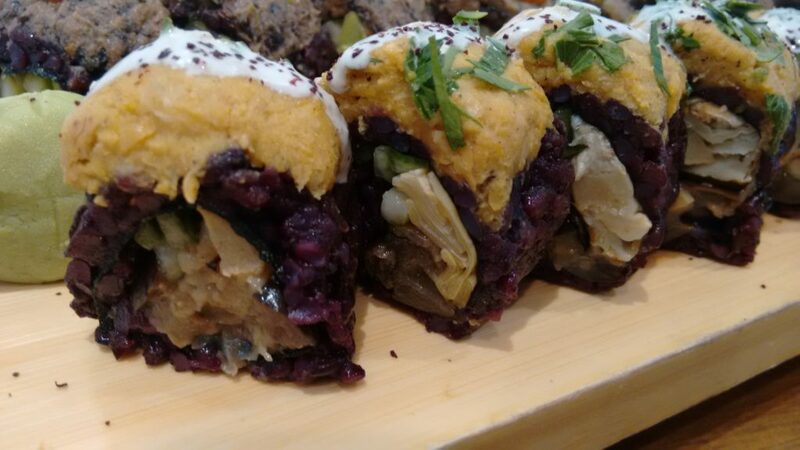 The cabbage, artichoke and whatever the shaved, fried veg was (that you can see on top – but was not mentioned in the dish description) were delicious. The cauliflower just really tasted boiled, and the roast parsnip wasn’t as roasted as I’d have liked. 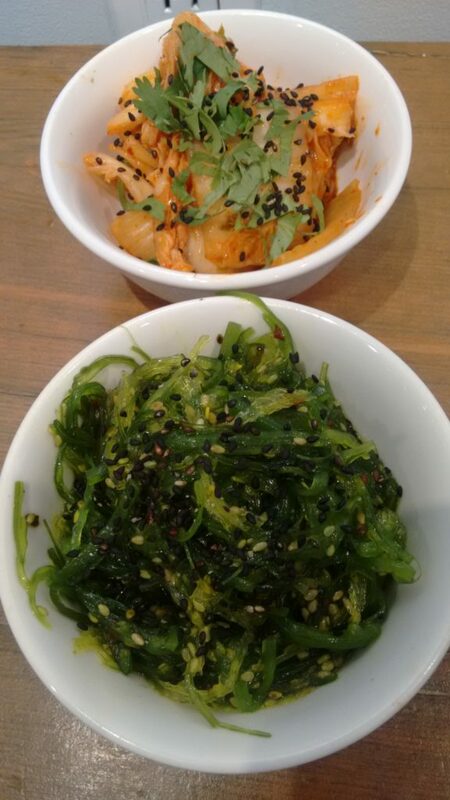 All in all, not bad, but a dish really needs a grain or legume to plump it out and satiate. 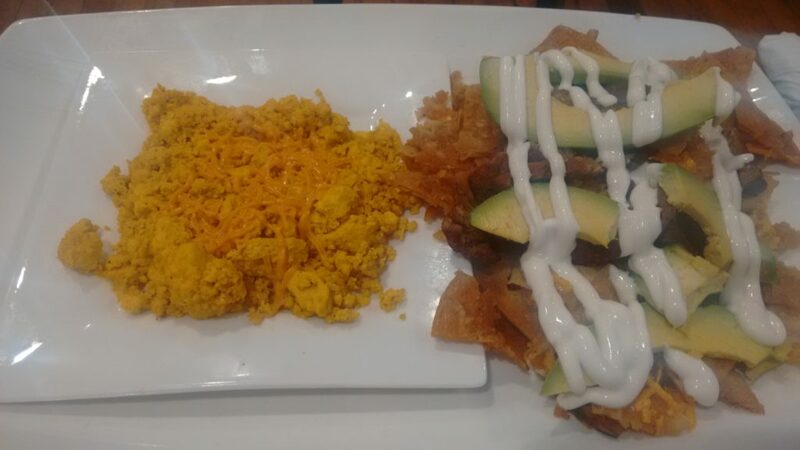 It really wasn’t that filling. I like to feel that I’ve eaten, when I’ve eaten. 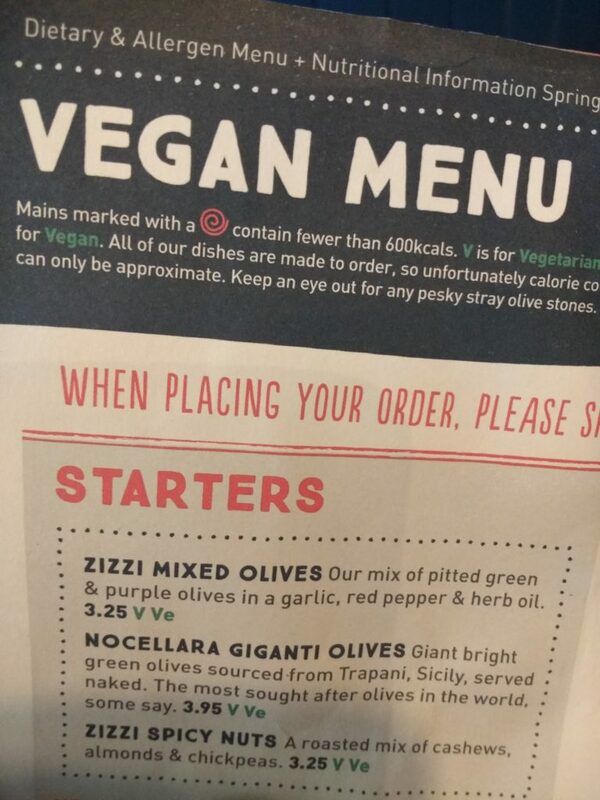 Luckily, my partner had ordered ‘Frittelle di farro e insalatina, con fagioli all’occhio nero e cime de rapa,’ or spelt and salad fritters, black-eyed peas and turnip tops, and we ordered a side of roast potatoes with garlic and rosemary. 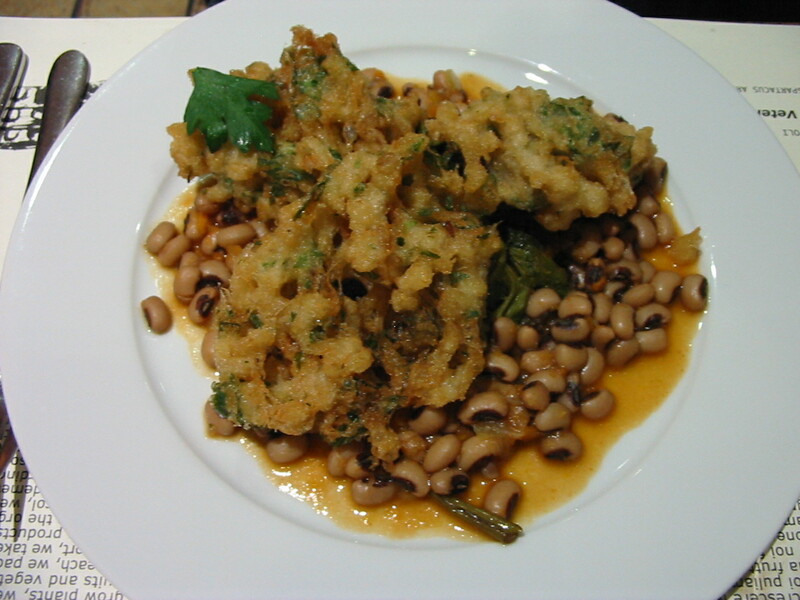 Now to me, black-eyed peas and turnip greens are Southern US soul food (another cuisine I adore). I didn’t know they were particularly Italian. This isn’t a complaint, I’m always up for black-eyed peas, it was just strange seeing them in this context. The fritters were fantastic; light, not too greasy, and the spelt made the batter taste richer. My lovely partner let me have most of his peas and turnip greens. This, exactly this, is why we’ve lasted twenty-one years. 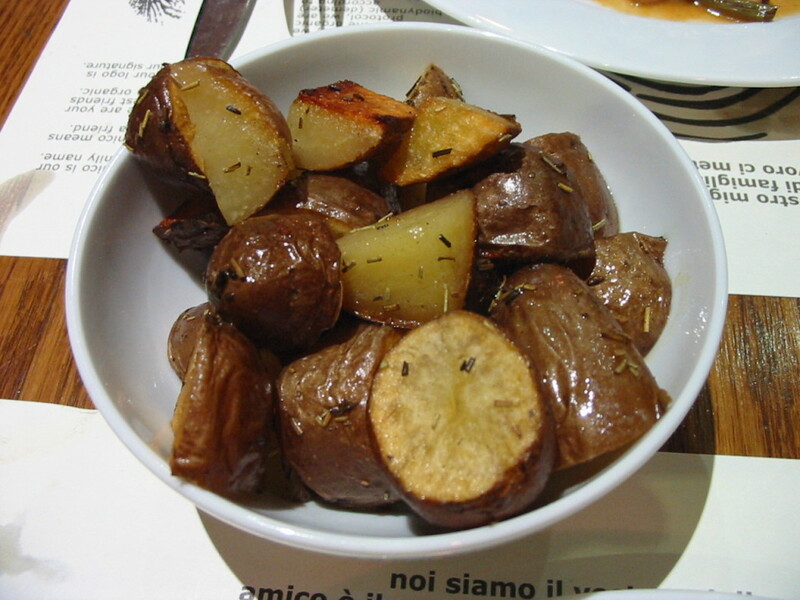 We shared the roasties which were bursting with earthy flavour and subtly complimented by the rosemary. 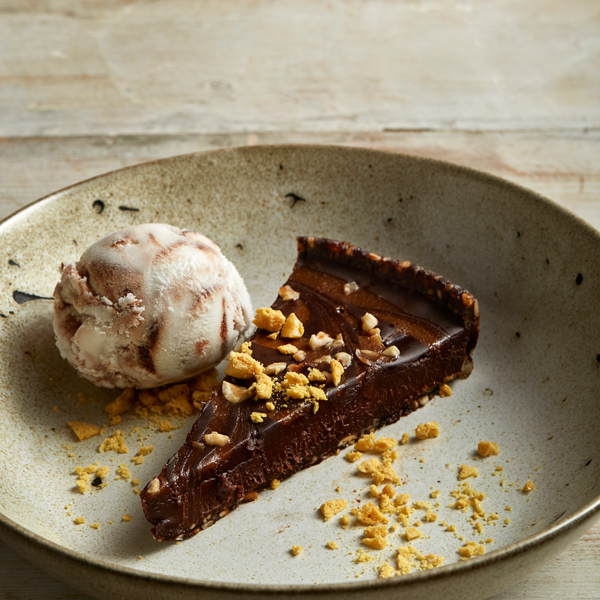 And then, AND THEN, came time for dessert. 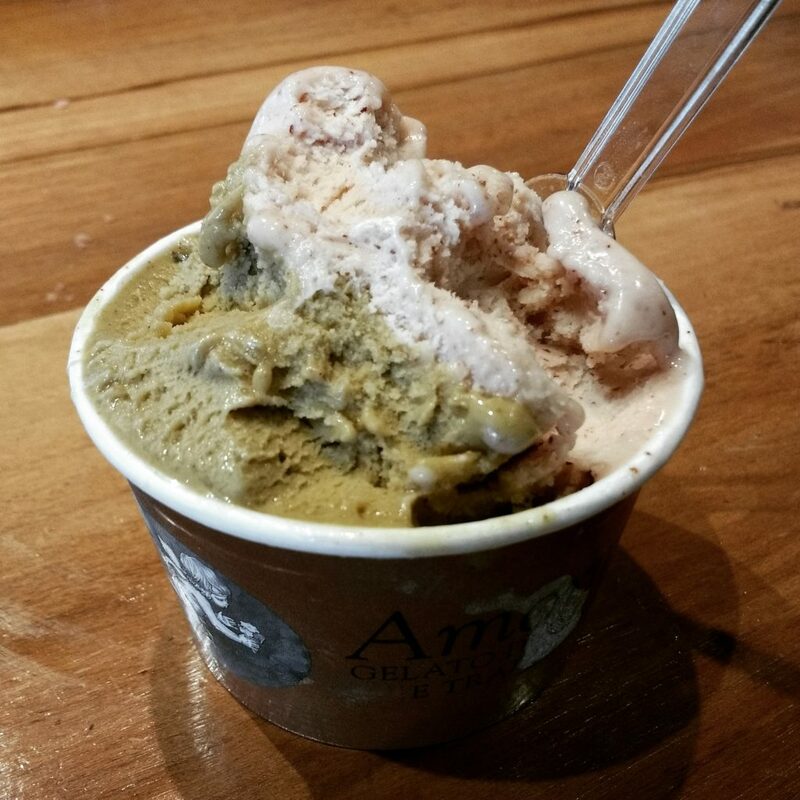 I knew the restaurant had a selection of homemade gelato, and I’d seen online that they had pistachio flavour (MY FAVOURITE!!! Or one of them, I seem to have a lot of favourites!) 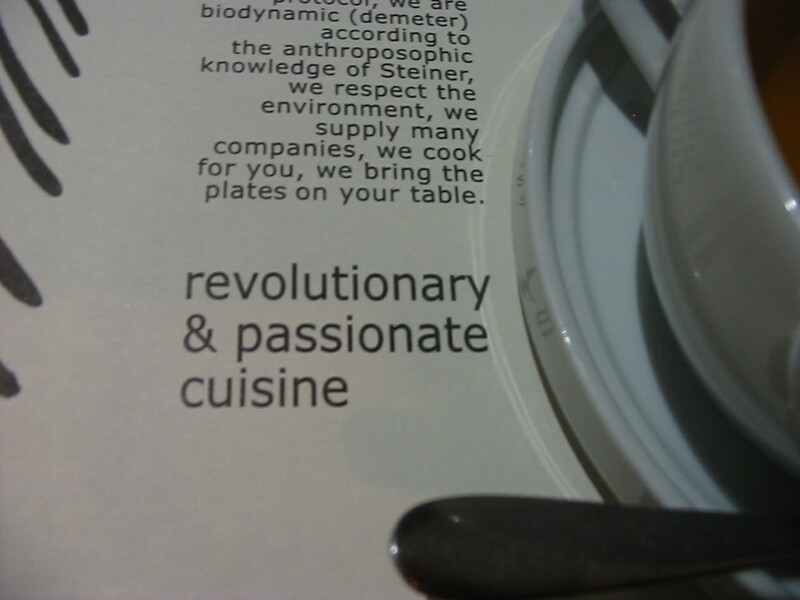 I was almost too scared to ask if they had it this night, what with the menu being as fluid as it was. But they had it! 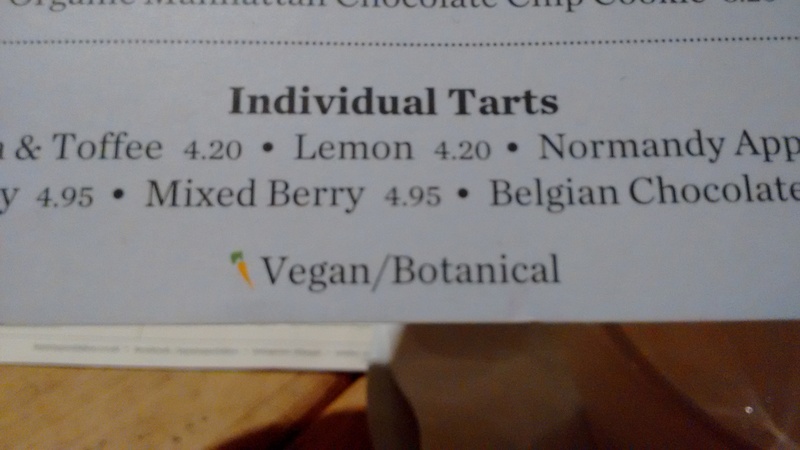 They also had several other delicious sounding flavours – the only one I can remember is elderflower, but they all sounded so delicious I nearly got thrown from my focus. 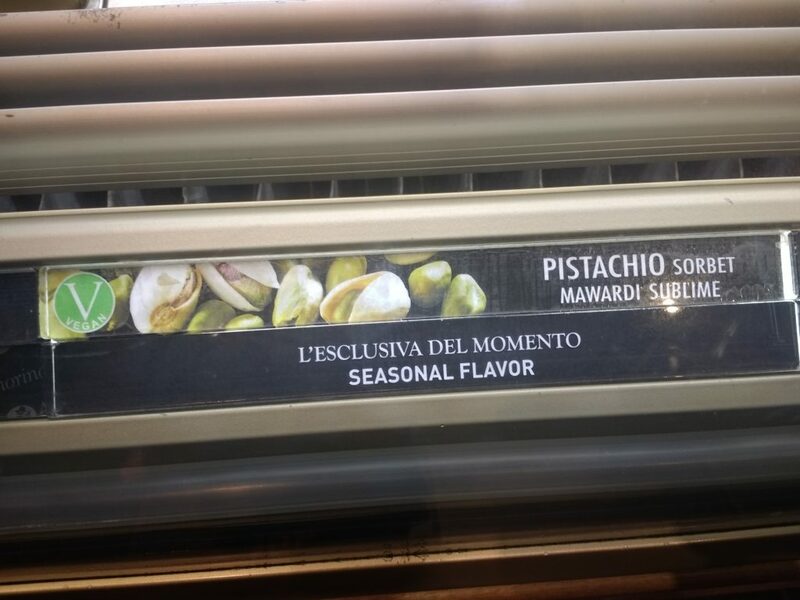 I stuck to pistachio though, and was not sorry. 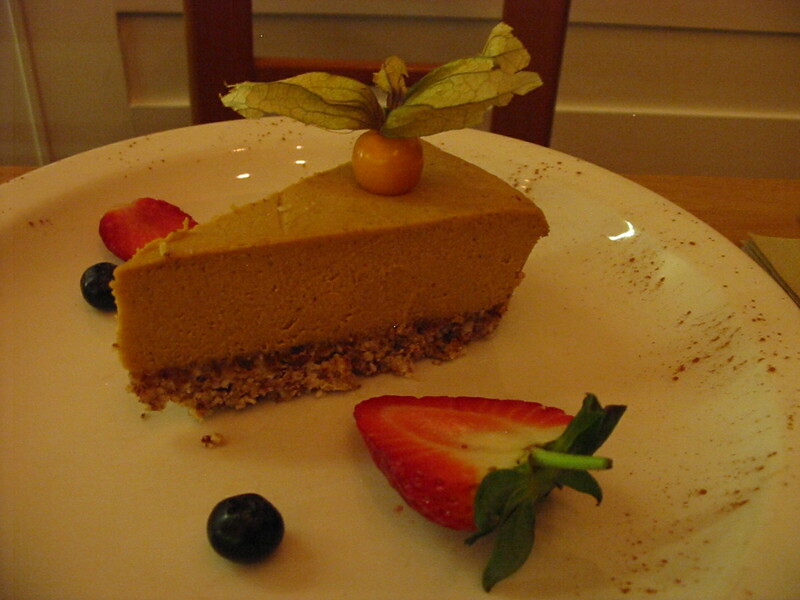 The pistachio came through loud and clear, and the sweetness was at the perfect level: sweet enough so you know you’re eating dessert, but not the slightest bit sickly or cloying. I could have eaten a LOT of this! 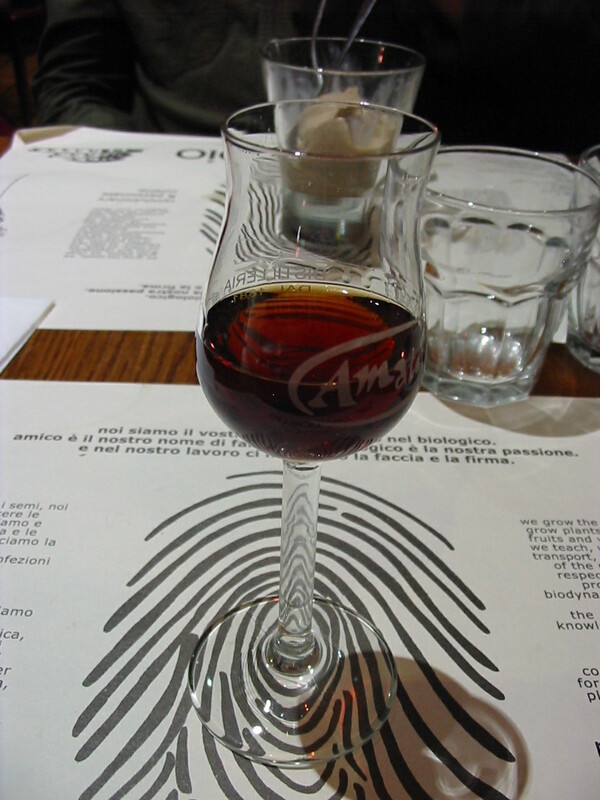 My partner had a quintessential Italian liqueur, Amaro Alle Herbe, which just means herbal liqueur. It contained herbs like mint, sage, gentian, rosemary, centaury; and spices like cloves and cinnamon. I didn’t try this. I don’t drink alcohol. It smelled a little like a dental rinse, though I kind of got why it might be nice. If you like that sort of thing. My partner loved it, and said it was very warming. 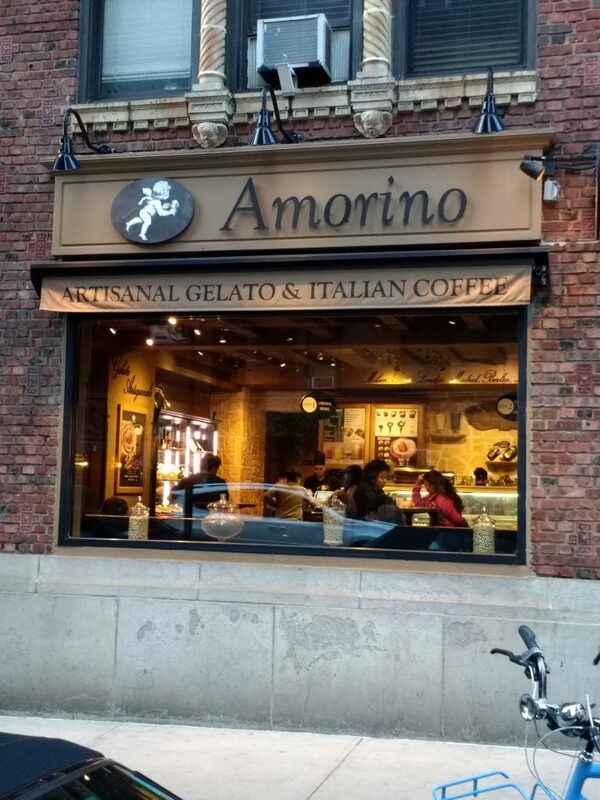 I’m kind of blinded by the delicious pistachio gelato and my old favourite black-eyed peas, which make me want to say I’d definitely go there again – and I would, that’s not wrong. And the prices are reasonable; and service, while in no way exceptional, was acceptable. 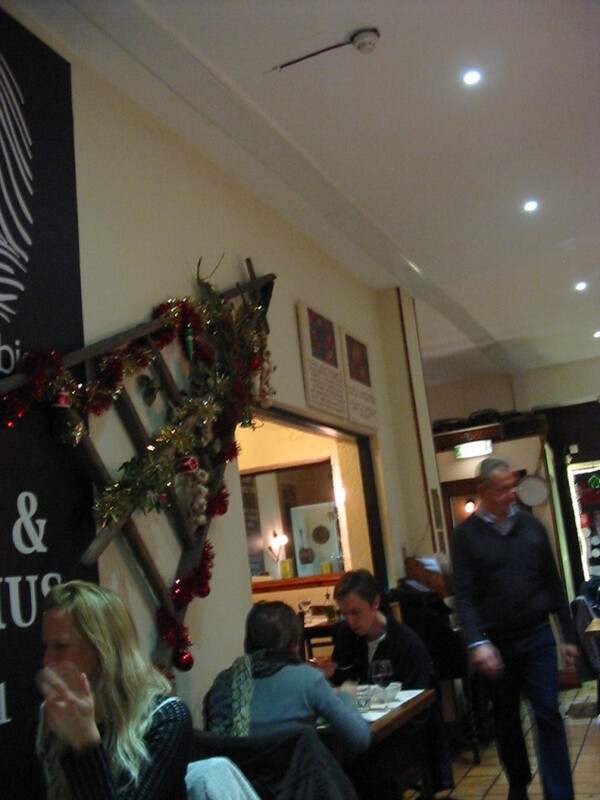 And it also should be said that the restaurant is in a nice area and has a great look and atmosphere. 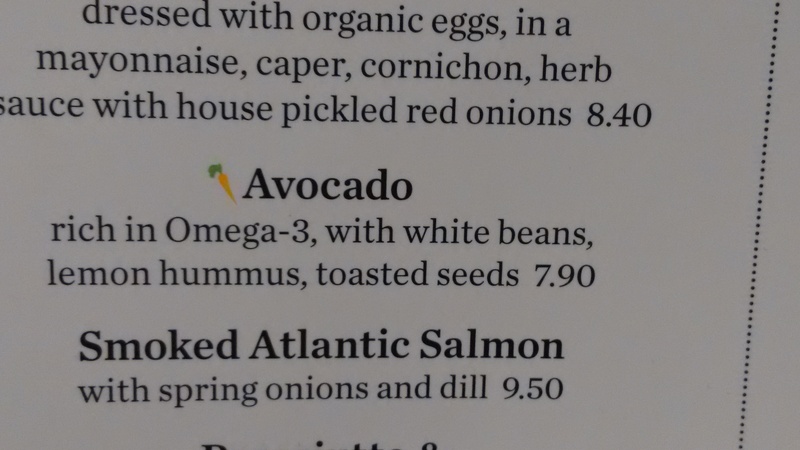 BUT, in my opinion, a bit more thought needs to be taken with menu items. 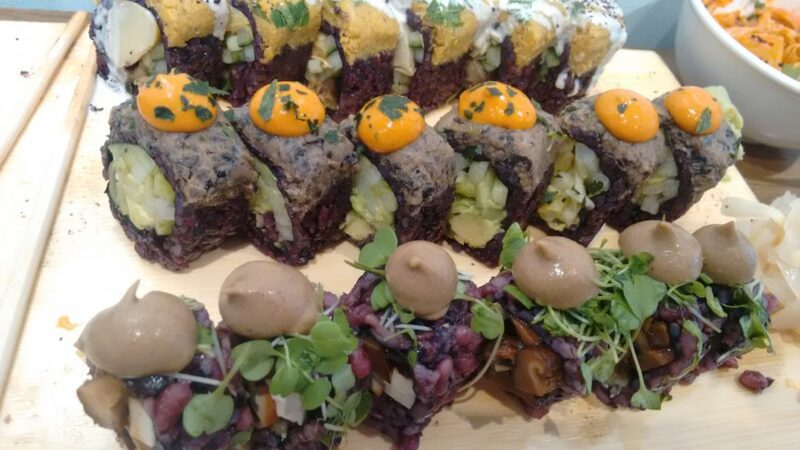 While the veg are certainly flavourful and fresh, and the gluten-free crowd have plenty of options (too many really, when you consider that very few people actually need gluten-free food); there is not enough emphasis on WHOLE foods where the grains and pastas are concerned. This means that those wishing to avoid refined and processed grains do not have much choice. 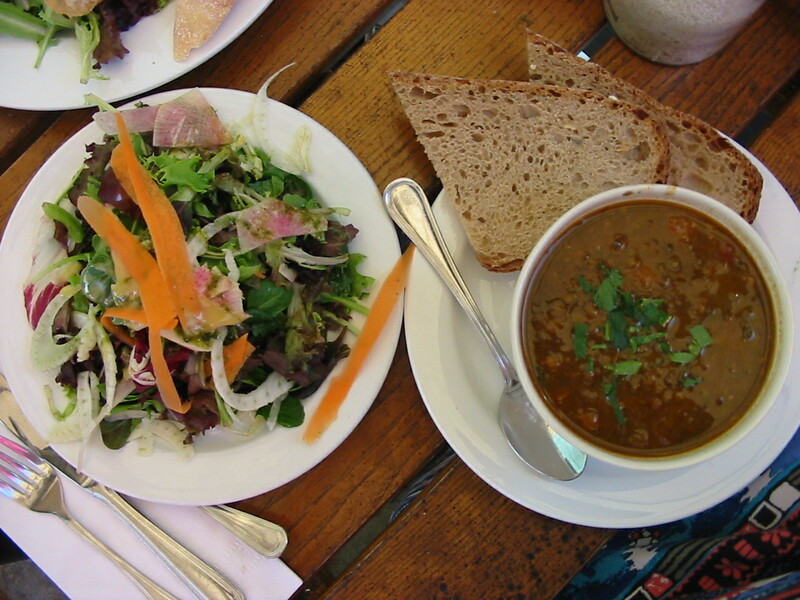 As I said, whole grains ARE offered on the online menu. 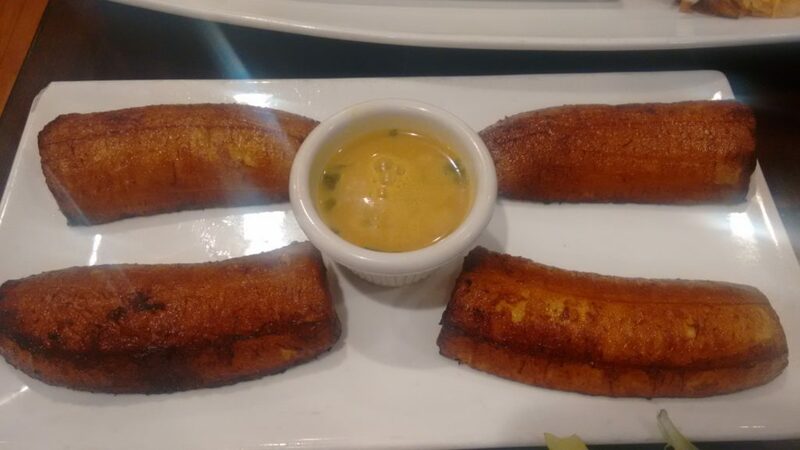 I have no idea why they are not offered in the restaurant. 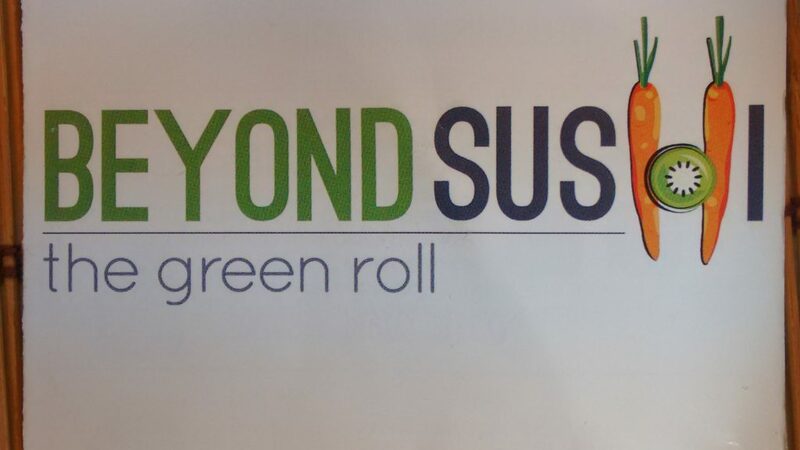 You should absolutely try this restaurant. 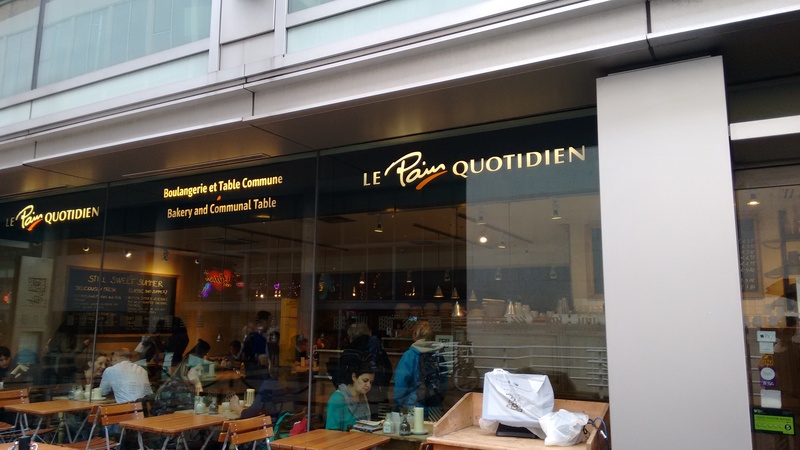 Whether you live in London or visit here from elsewhere, it’s a great lunch/dinner venue, and just down the road from the British museum.